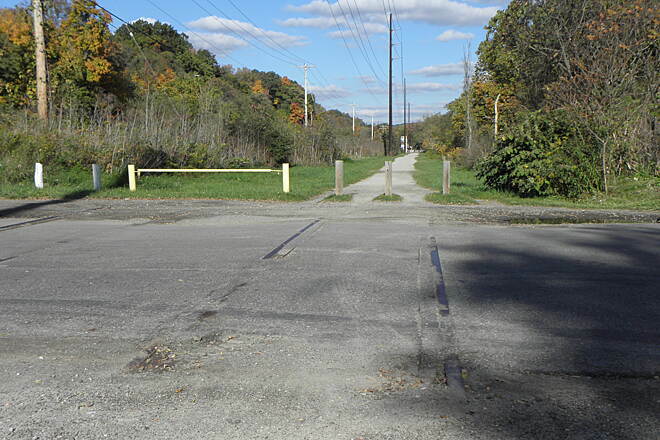 The Montour Trail follows a portion of the old Montour Railroad, which was built between 1877 and 1914 to link the Pittsburgh and Lake Erie Railroad with the region's many coal mines. 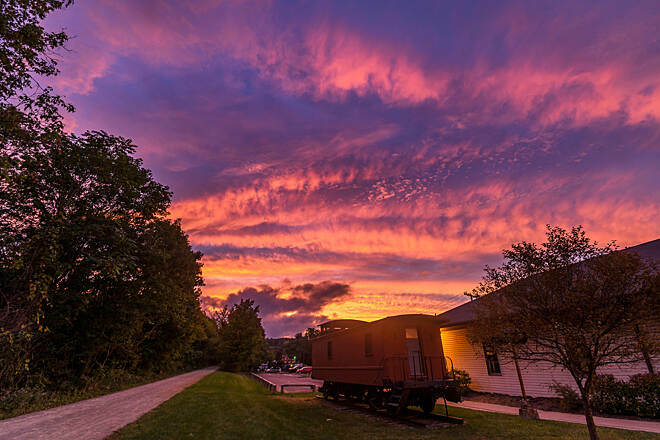 Forming a semi-circle around Pittsburgh, the Montour Railroad also connected other railroads, including the Pennsylvania, the Pittsburgh & West Virginia, the Baltimore & Ohio, and the Union. 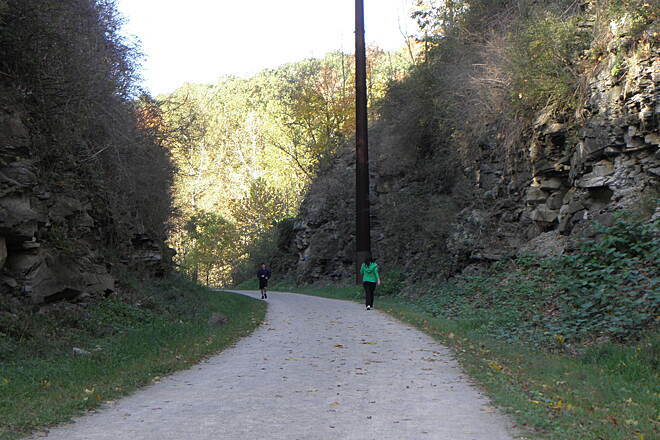 The trail's surface is primarily crushed limestone; more information on its two short paved sections can be found below. 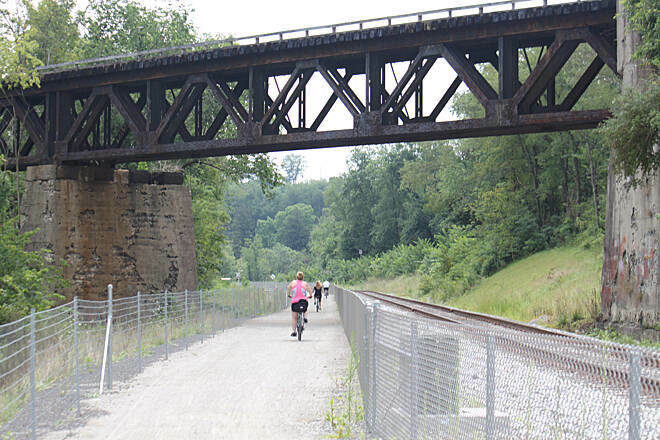 Both the trail and the railroad are named for the creek that runs alongside; you'll follow the waterway for the trail's first 8 miles beginning in Coraopolis. 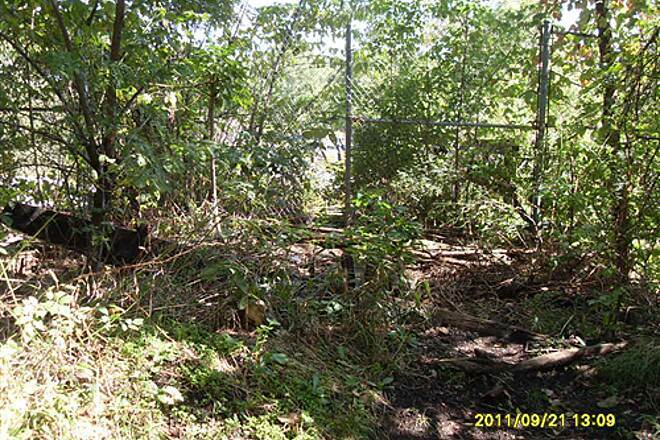 Views will primarily be of leafy green neighborhoods sprinkled with wildflowers. 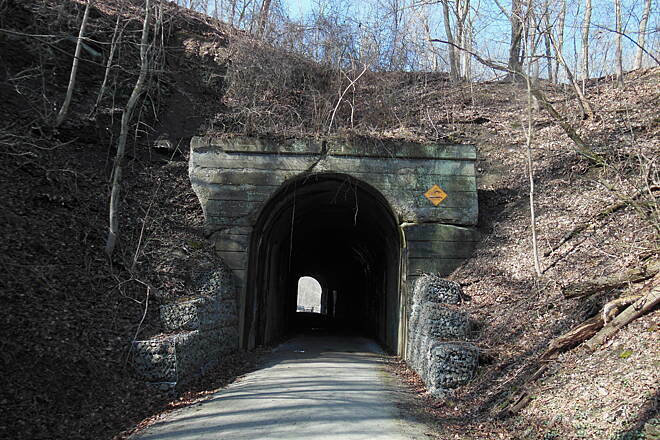 A highlight of the trip includes the Enlow Tunnel in Findlay Township, which stretches 500 feet. 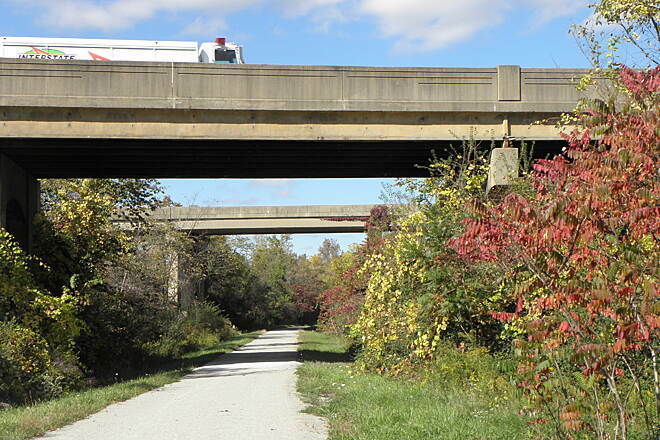 Just south of the tunnel, the Airport Connector segment branches off from the main trail, using limited-access roads to reach Pittsburgh International Airport. 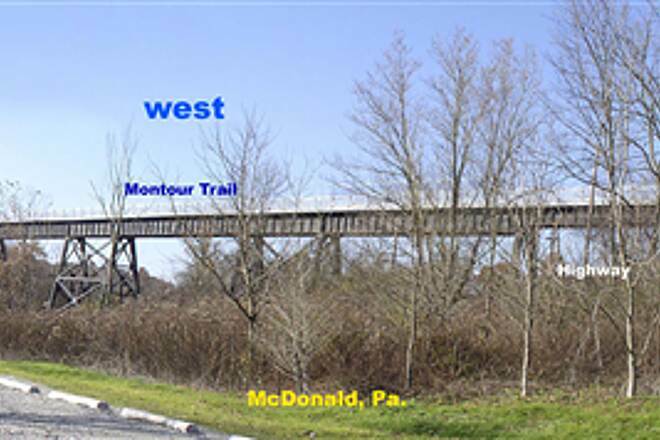 On the outskirts of McDonald, the impressive McDonald Trestle spans more than 900 feet. 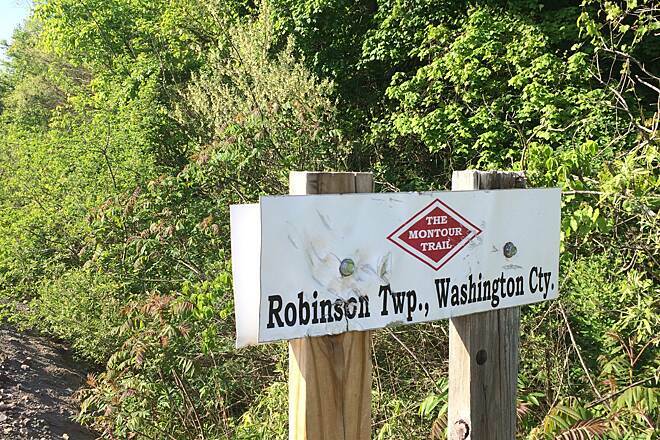 Here the Montour Trail connects directly to the Panhandle Trail, which travels east to Collier Township and west to Weirton, West Virginia. 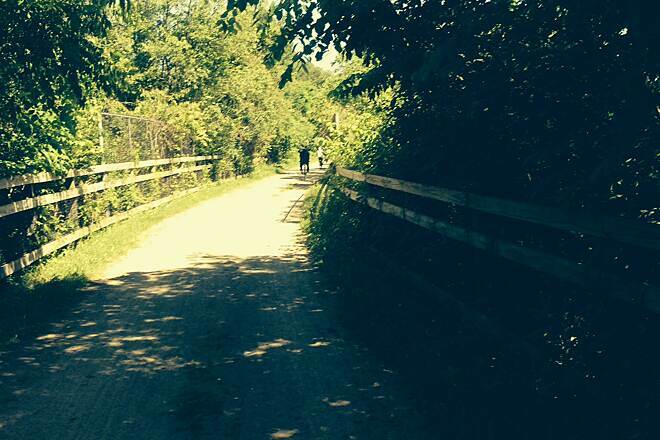 Between McDonald and the small community of Southview, the trail offers beautiful rural landscapes. 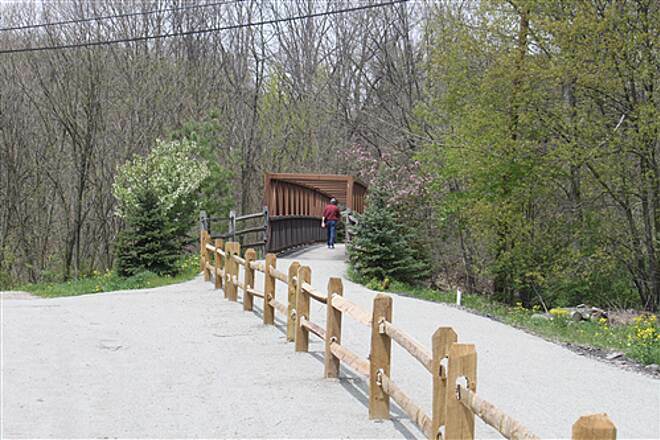 One of the newest segments of the trail splits off from the main route near Southview and heads southwest to Mount Pleasant Township. 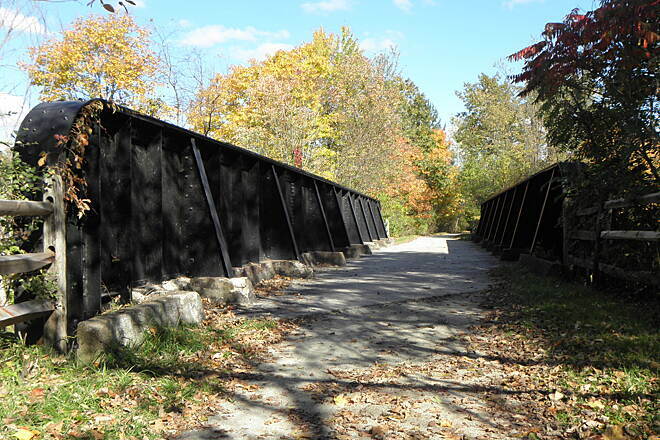 Known as the Westland Branch, the entire length of the trail parallels an active railroad line. 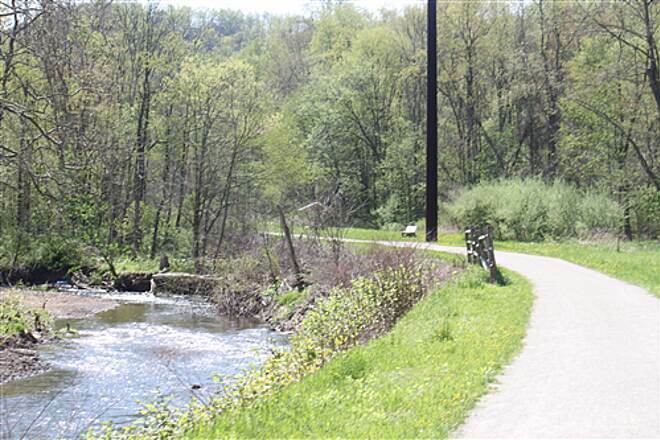 In Peters Township, you'll find a paved section of the Montour Trail, known locally as the Arrowhead Trail. 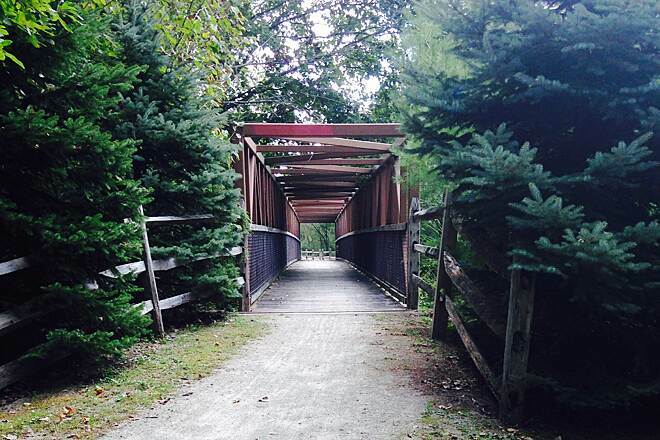 The township planted 500 trees along the 4-mile route, which opened in 1985. 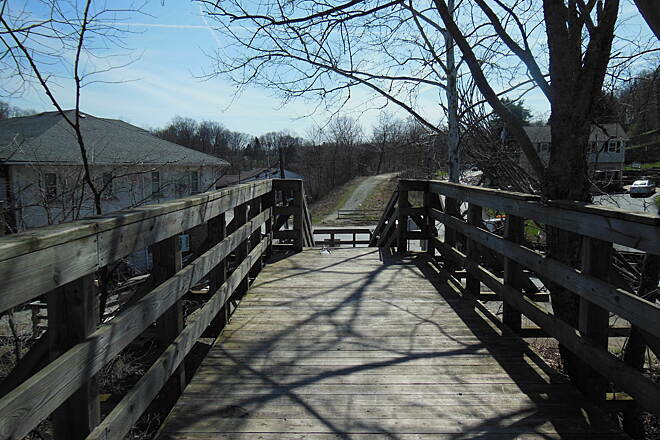 The trail passes among a wooded corridor in suburbia, linking neighborhoods with parks. 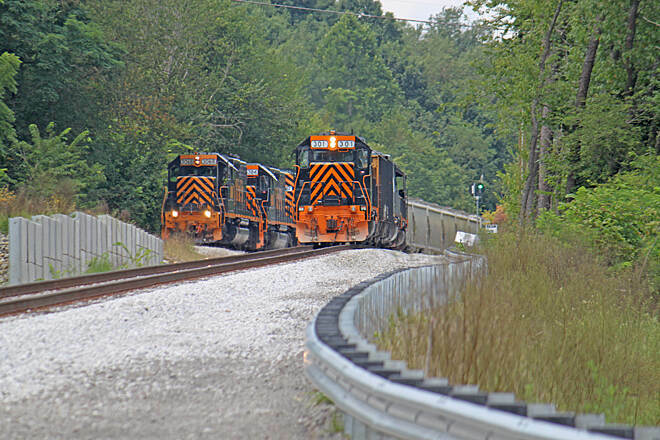 Another two-mile paved section runs through Clairton. 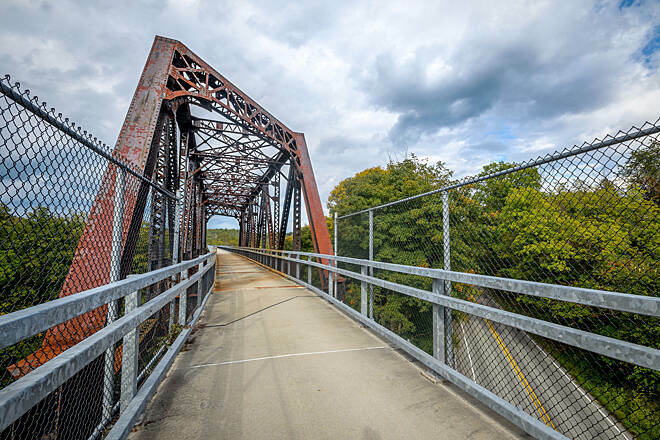 Here, at the trail’s eastern end, a short on-road route leads to the Great Allegheny Passage, which spans 150 miles between Pittsburgh and Cumberland, Maryland. 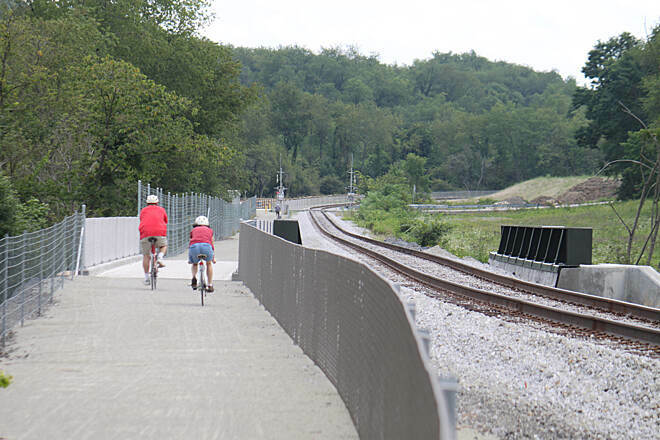 Improvements to the Montour Trail are constantly in the works, with interim on-road routes set to be replaced by new sections of trail on the former railroad corridor in the near future. 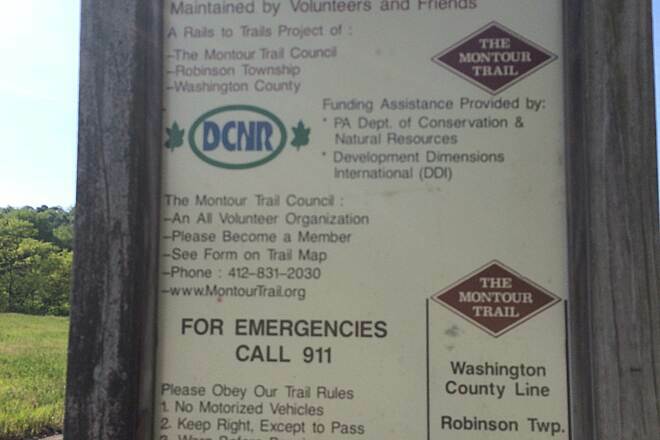 Refer to the Montour Trail Council’s official website for more information. 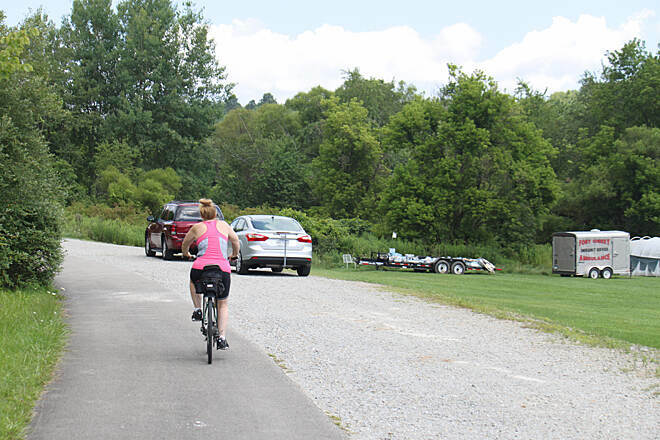 Trailhead parking is available at either end of the trail (along Montour Coketown at the northern end of the trail and off N. State Street at the trail's southern end), as well as many points in-between. Check the TrailLink map for parking areas and directions. 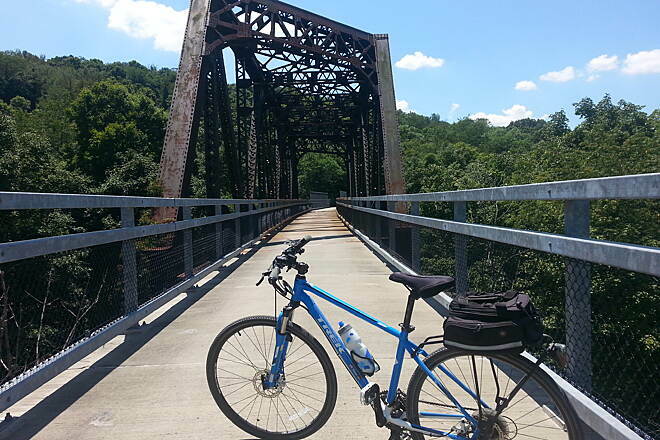 We started near Washington Pa and enjoyed the quality of the trail. Well maintained and clearly marked with adequate facilities along the way. 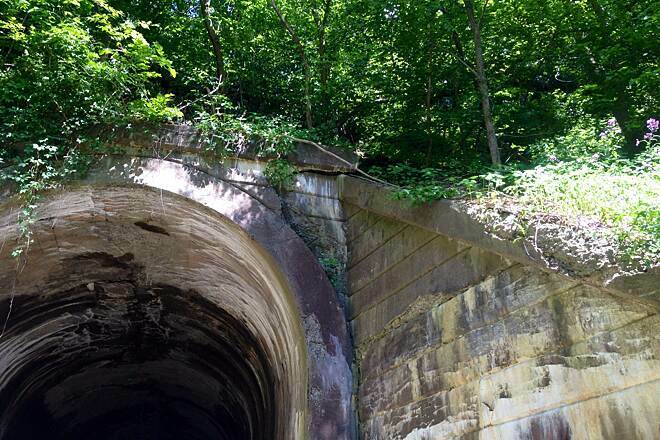 The tunnels are a treat and an exciting ride through old Pennsylvania rail space! We started at milepost 6 at the Cliff Mine parking area and went out and back to milestone 25 (national tunnel) on a warm day (88 Deg F). The ride was great with shade over 75% of this portion of the trail. 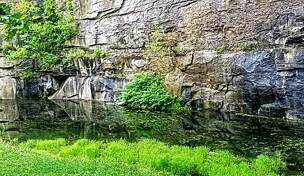 The trail is well maintained and almost all was crushed limestone. 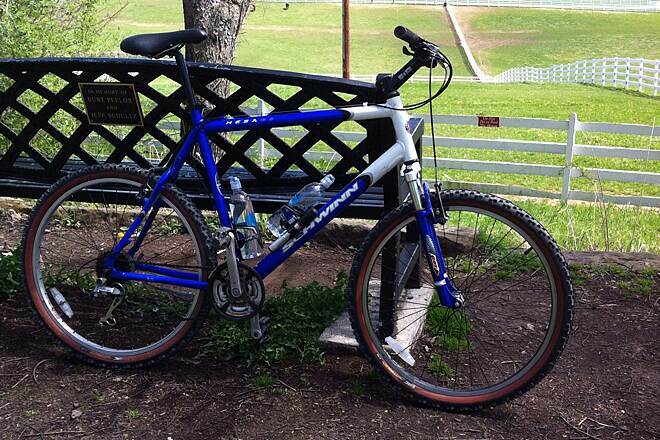 We had road bikes and were fine with these. 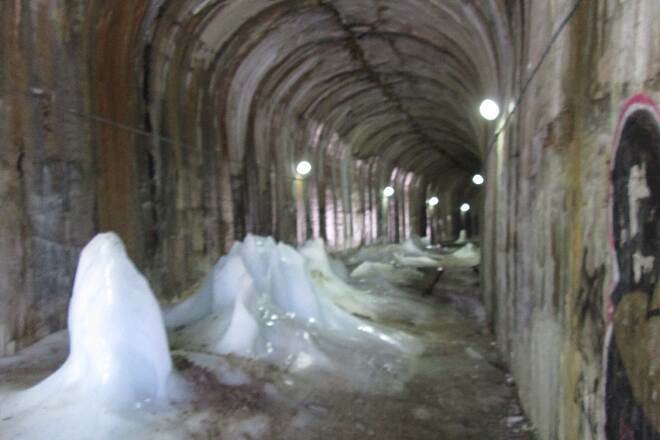 Went through 2 tunnels (milepost 7 and 25) where it was cool and very moist (water flowing on walls and some dropping from the ceiling). 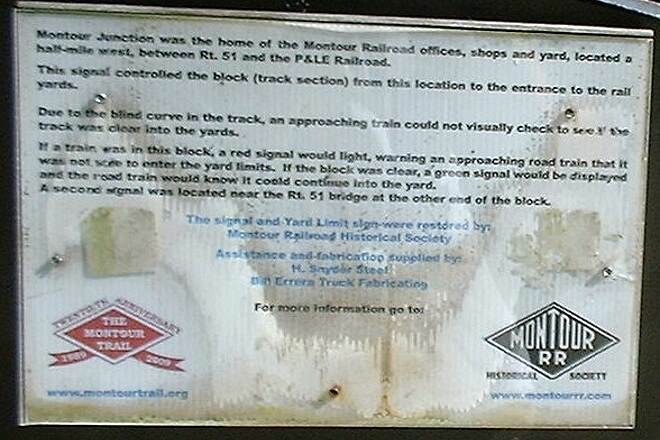 Nice historic signs along the way describing bridges and coal mining and processing that was previously in this area. Very well done. 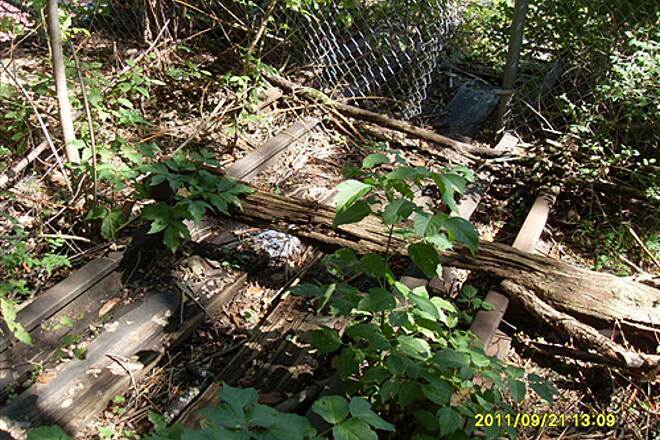 It was obvious the trail is continually maintained and was in great shape. 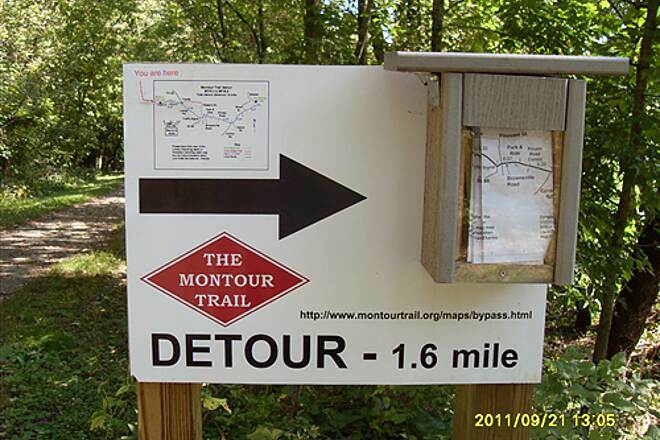 Regular water stops and trail maps every five miles and pocket maps available at the trail and online. Many trees alongside the trail provided great shade but blocked the view. Gradual grade up and down throughout. Only a few city blocks are on city street. All rest was off road. Overall great ride. I recommend it. 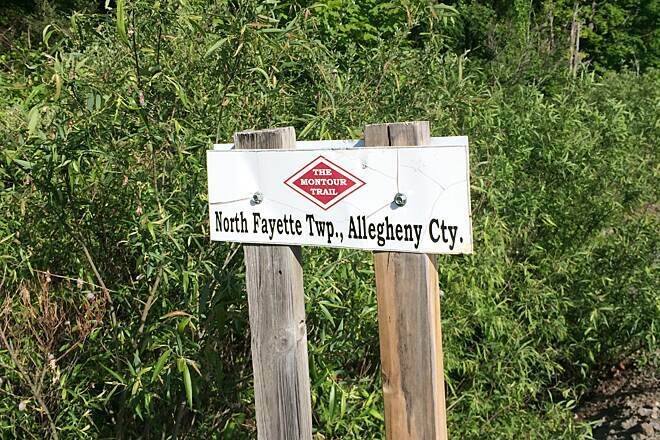 We started at the Clairton end of the trail, and I don't care to do it again. We biked about 7 miles out and turned around - only a small portion was on an actual trail, the rest was on back roads as well as a brief section on a fairly high-traffic road. Hoping to start at the other end next time and have a better experience. 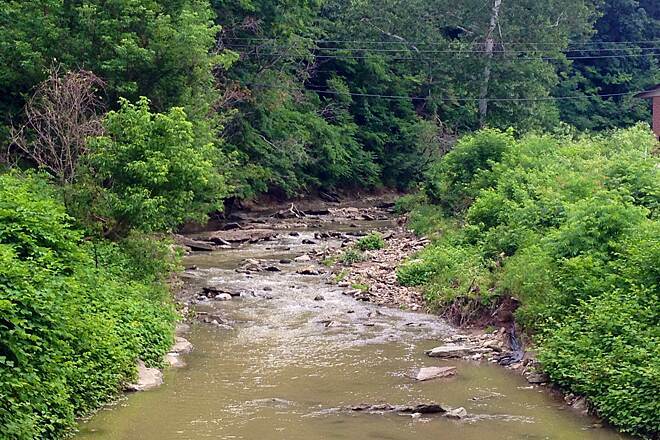 Great place to run as opposed to the streets of West Mifflin. Started at the south east trail head, which has moved about 0.1 miles due to construction, and ran 2.5 miles out then back for a total of 5 miles. The trail was great and it felt like I was running downhill both ways. Hope the rest is better. My wife and I started at the end of the trail. While the trail was nice the detours on the road was not what we expected. My wife is not comfortable on the road and we did not expect it. The detour around mile 36, I think, was not marked on the road and did not know where to go so we turned around and returned. As I said earlier the trail was nice and enjoyed the scenery, just did not care for the road and detours because of trail construction. 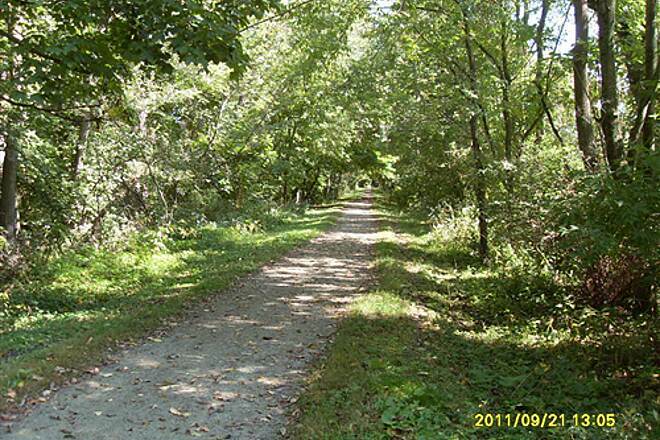 Later we will try the rest of the trail and hope to find more of the great parts of the trail. great trail. 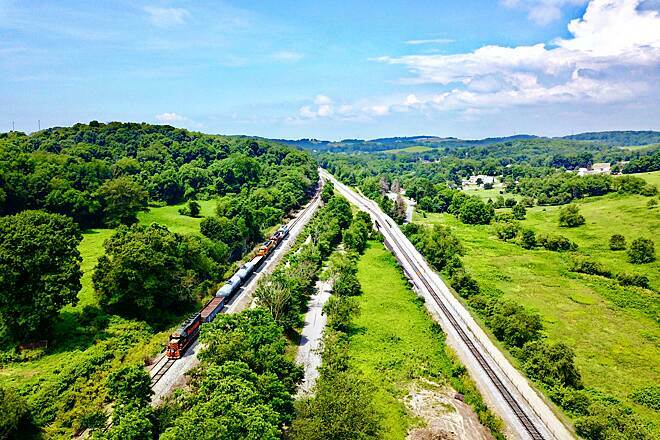 well maintained, easy access and great scenery. I've been riding this trail for years and have never had any issues with the way it's maintained nor with the improvements they have made throughout the years. 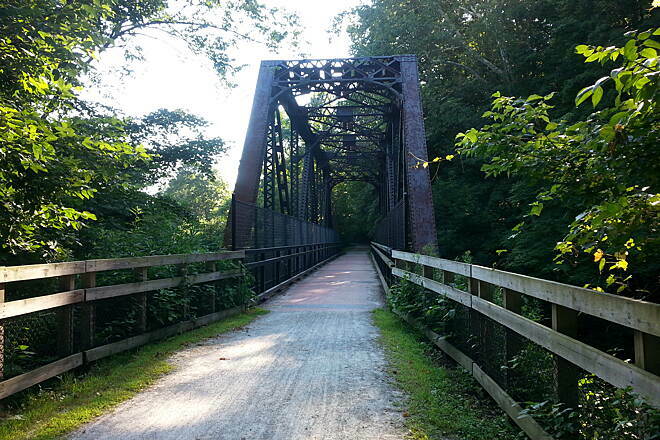 This by far is one of the jewels as far a rail trails go. 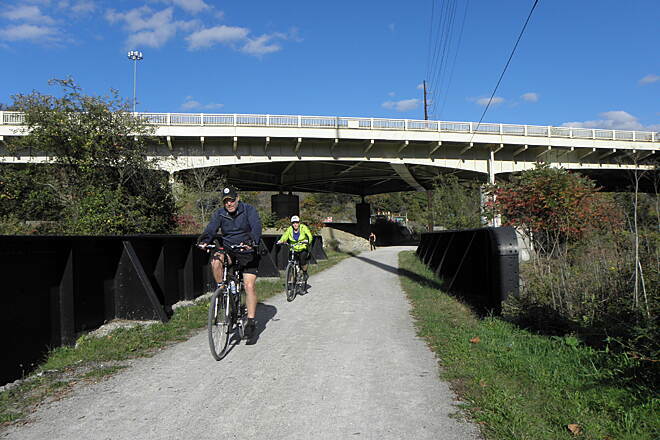 It is well-maintained and a joy to ride on all sections of the trail system.The people who volunteer and maintain this system should be commended for their fine work.It is a can't miss trail system. Nice elevation changes and a number of interesting sites along the way. 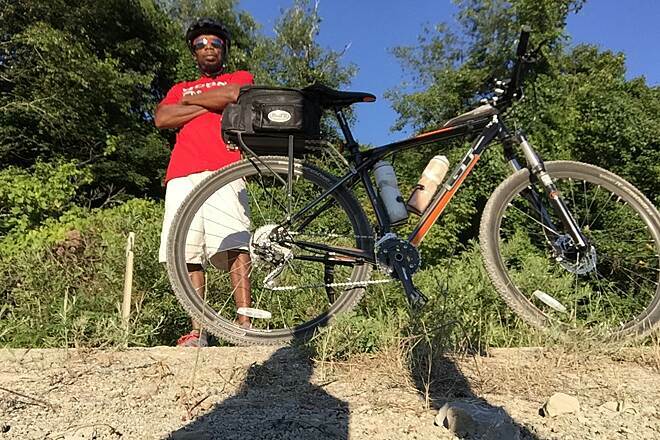 This past September I started my bike journey at Shepherdstown, West Virginia. 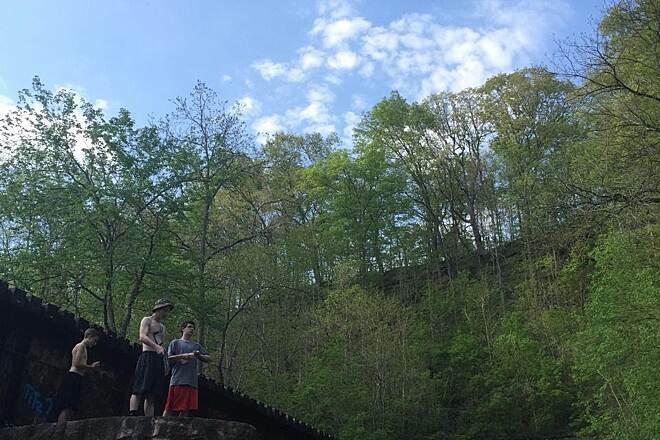 I connected with my buddy Andy four days later on the GAP trail in West Newton. 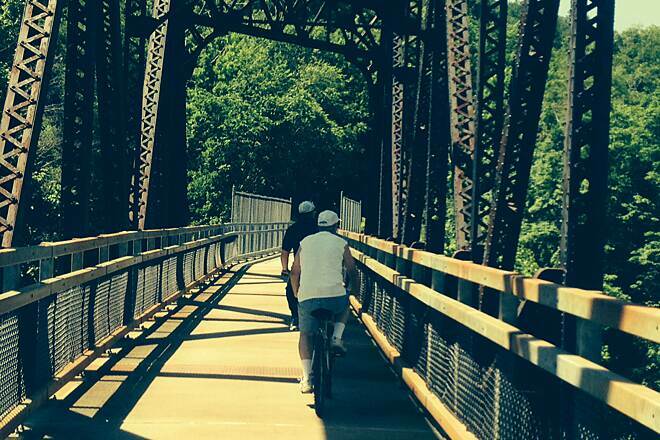 We spent the next five days exploring Pittsburgh and the surrounding bike trails. 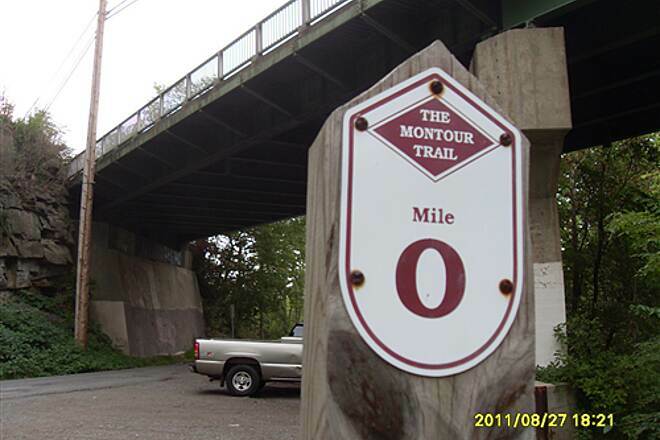 One trail that stands out was the Montour trail. Although there was an area under temporary constuction the trail is well maintained, thanks to people like Budd Halpin and his wife. Budd and his wife greeted us at our first overnight camp, offering us refreshments along with information about the Montour trail and its past history. 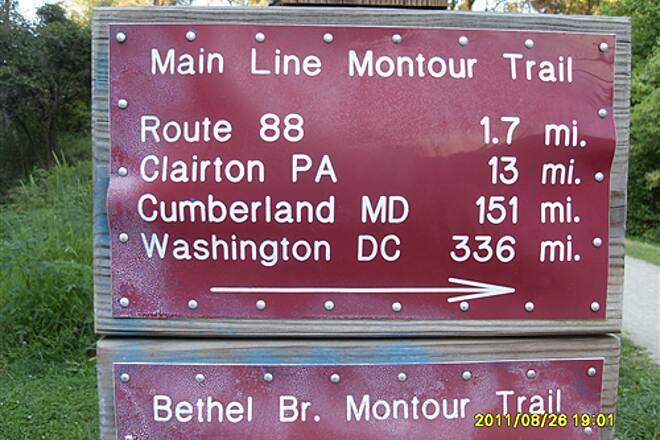 The Montour trail is a trail I look foreword to doing again. 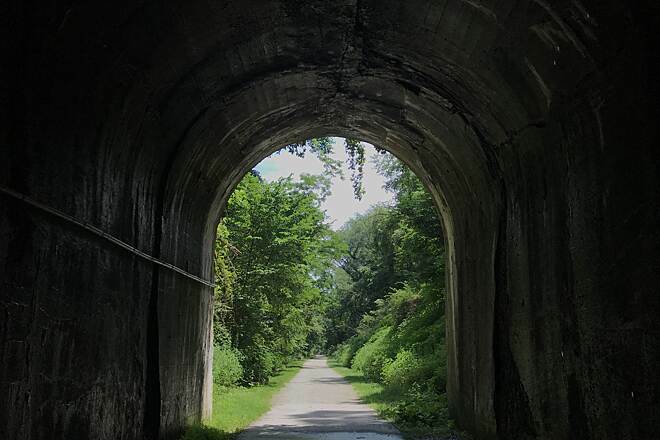 In September for my birthday my biking Pal Tom and I had the wonderful experience of riding both the GAP from West Newton down to the Pittsburgh Point then doing the Montour rail to trail. 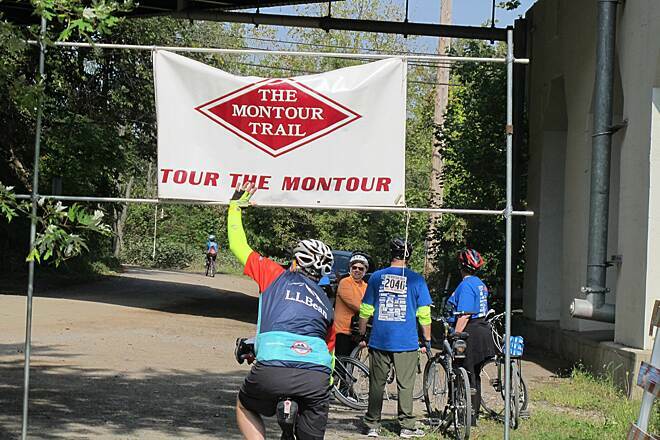 The Montour was a most pleasant surprise. 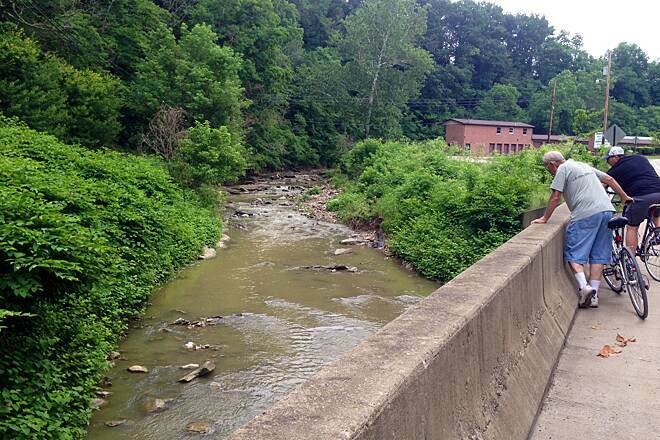 We were looking for something a little different and found it in the Montour. It was well maintained thanks to the fine work of volunteers such as Bud Halpin and his wife who we just happened to met at our first camp. 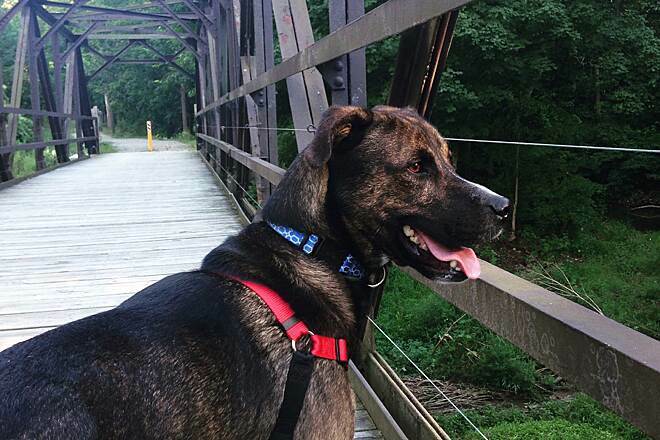 Not only did Bud recognize me from my riding with Crocs but he really was interested in how we liked the trail. 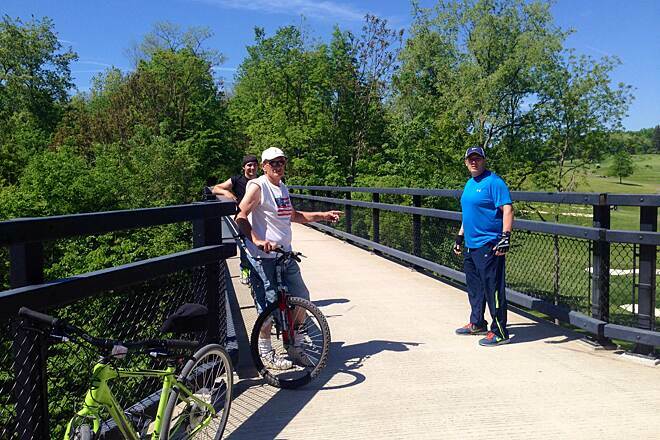 As a Boston/McKeesport Native I can say that it is the volunteers along the trail that make for a fun experience. 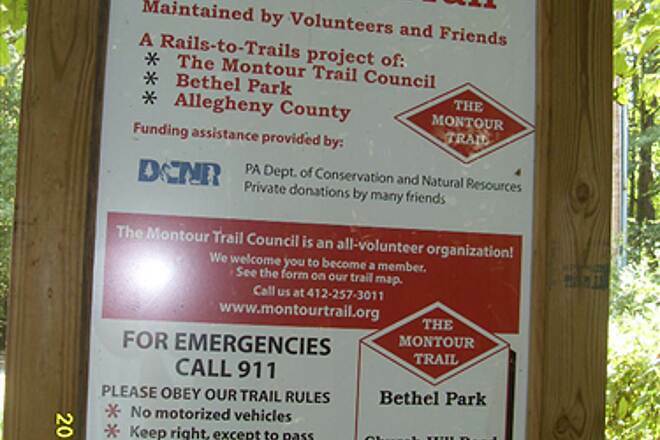 I enjoyed spending time with Bill Hall at the Mon/Yough trail council and Bud on the Montour was such a genuine individual that I went back the last weekend in September to ride the 13th annual fundraiser. I got to ride with 543 of my new PA friends. I will be back to Western PA. 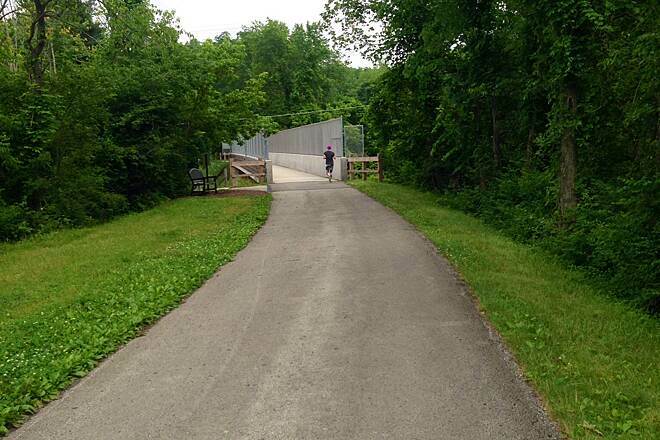 I rode 50 miles today from Library to Westland (a newer branch off of the trail). 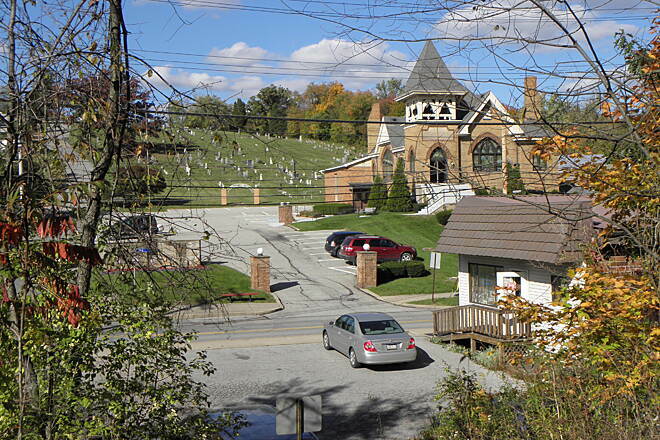 This ride included the Bethel park branch also. As a whole, it was an enjoyable ride. 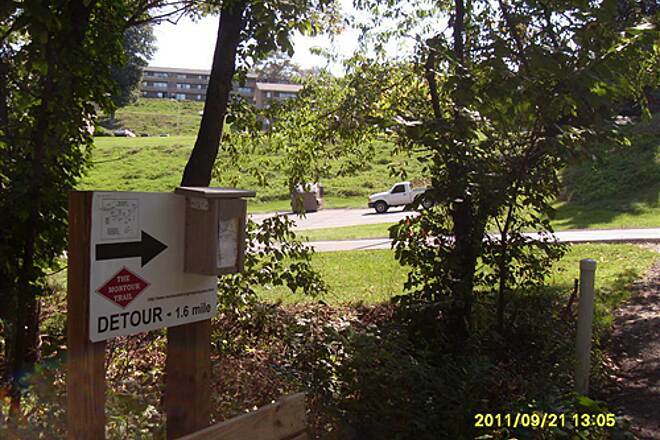 A downside was that when a detour was needed to bypass parts of the trail that were under construction, it was at times difficult because the signage for the detours (if present) was not always clear. 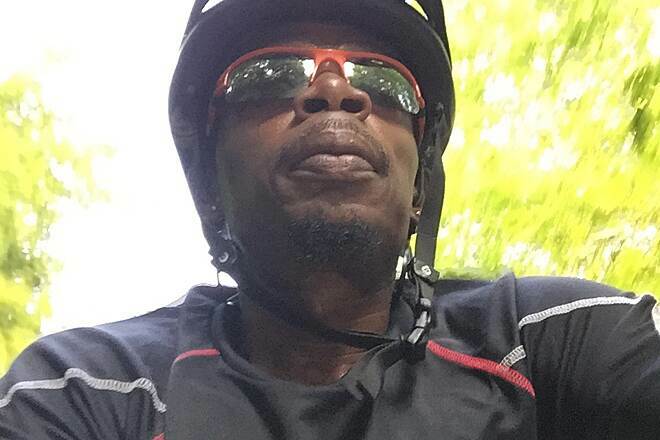 I rode from mile marker 0 to McDonald a couple months ago and that was a nice ride. There was one more difficult incline on the way back to pedal up, but that was a good workout. 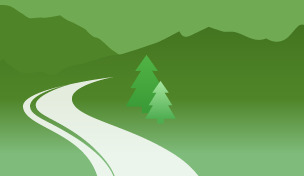 As a whole I would recommend the trail, but I would encourage parents taking small kids to do research ahead of time to make sure that you do not run into the sections that are on roads. 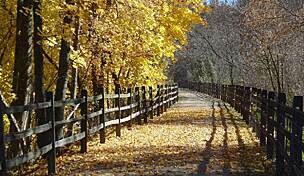 I have been on this trail several times and enjoy the diversity of the surroundings. 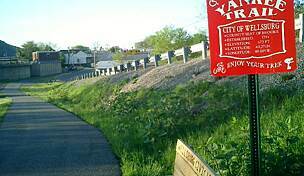 I live in West Newton so I am familiar with bike trails. 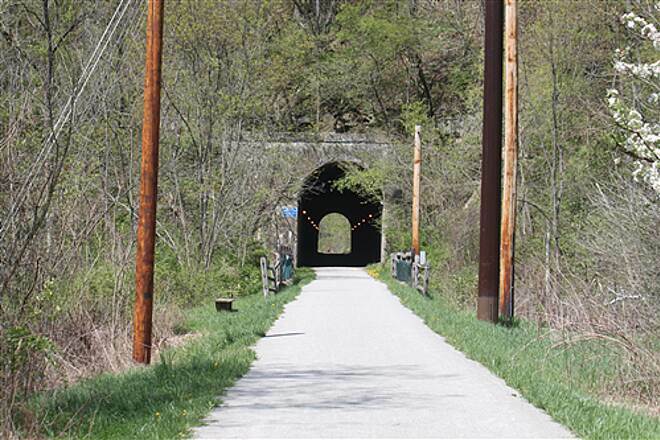 The Montour Trail offers sights and view plus an interesting trestle and tunnels that enhance the ride. 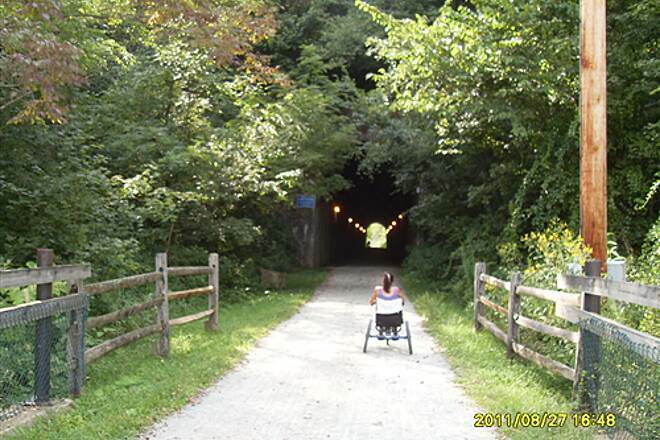 Great way to start the Allegheny Passage Trail . Park at the Walmart! What a blessing to have a safe place to leave our vehicles. The manager was ok with us leaving them in a certain area. Very close to the airport so when we got to DC we rented a car and returned it to the airport. 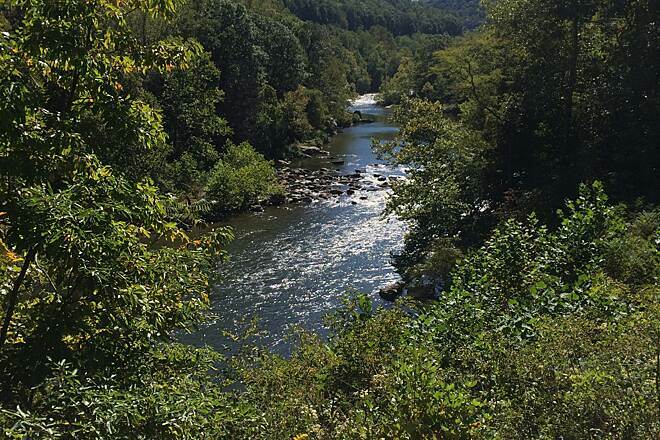 Did the Allegheny and the C&O. 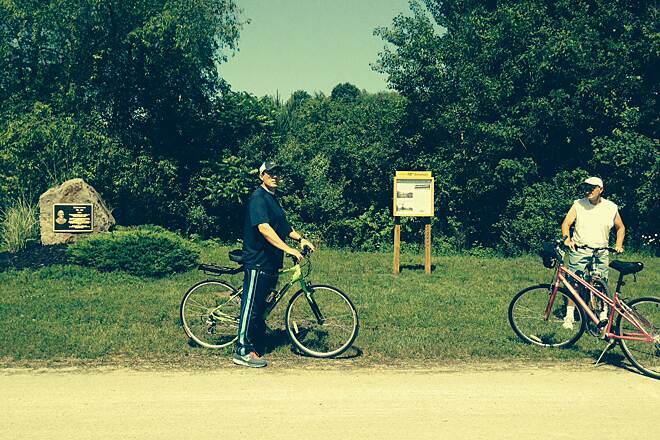 Can't believe we could bike all that way without being on a road. We are new to the biking world and really unsure what to expect when we started out today, but all in all it was a great experience! 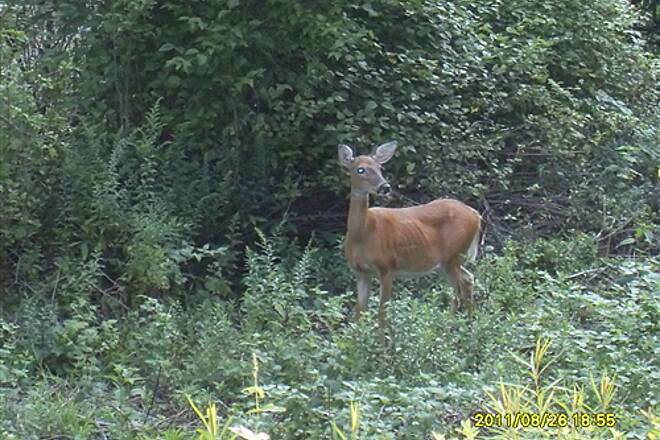 We live a mile from one of the trailheads in Jefferson. Despite looking at the maps ahead of time, we thought once we started out we would be able to ride on trail till we decided to turn around; unfortunately that wasn't the case. We didn't realize that we would have to ride intermitiently on the road for a couple of miles....that just wasn't going to happen with an eight year old who just became comfortable on a bike. We did not let that dampen our ride, we just looked at it as a learning experience. We packed up the car and moved down to the next parking lot that gave us the longest ride without going the the Library trailhead. 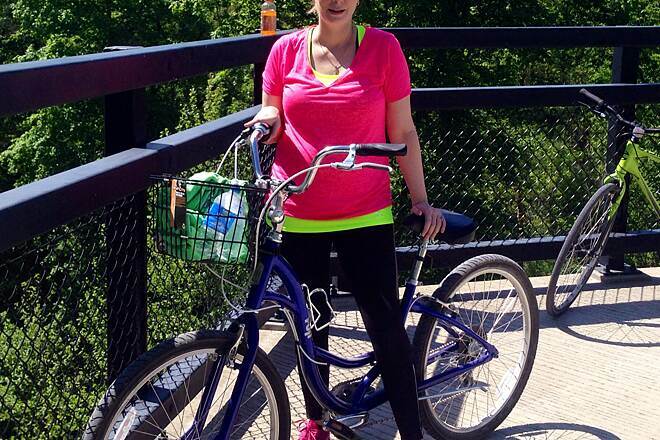 We ended up riding 6.3 miles in the end and having a great day! 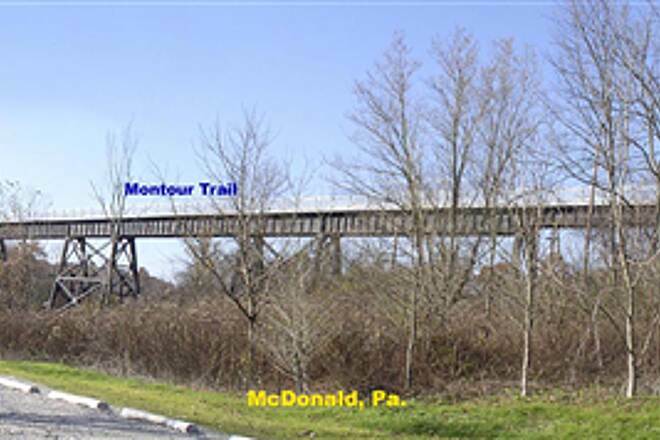 We look forward to donating to the Montour Trail to help them finish so ultimately we can stay off the road as much as possible. 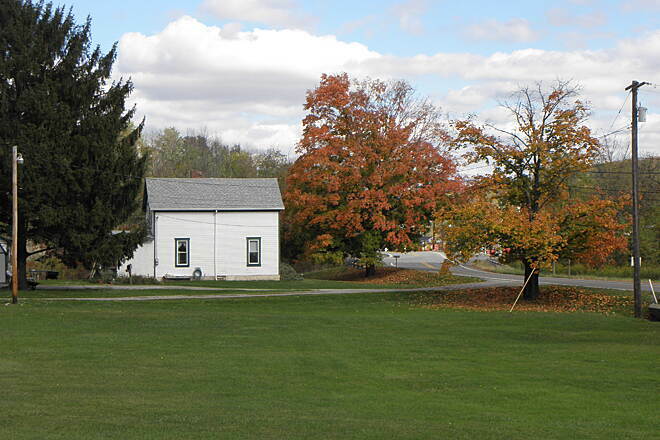 We can't wait to go back and plan a bit more and try the Library portion and head west. 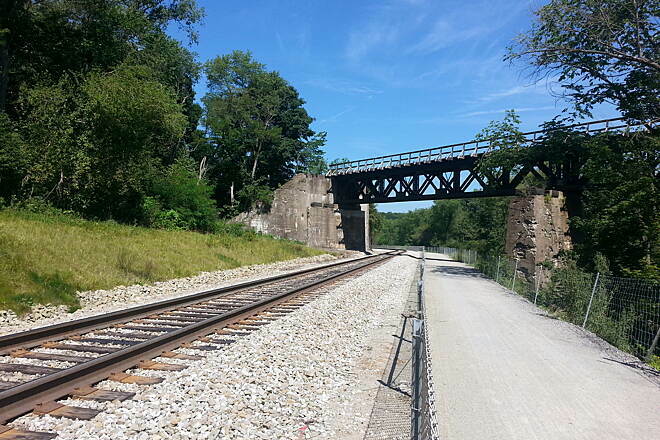 Thank you Rails-to Trails Conservancy what you are doing, it is great for families and towns to both grow and develop. 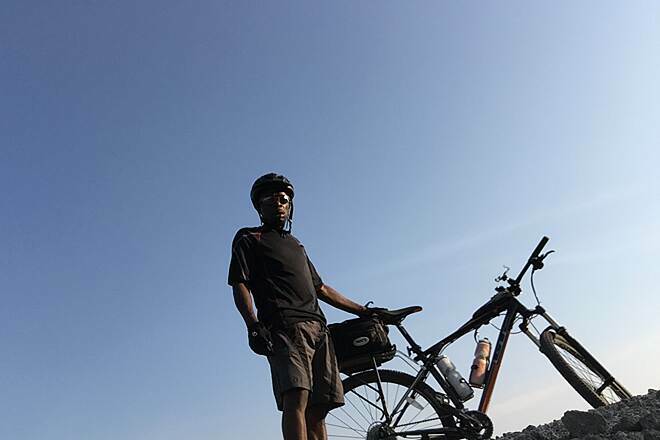 We look forward to future biking! 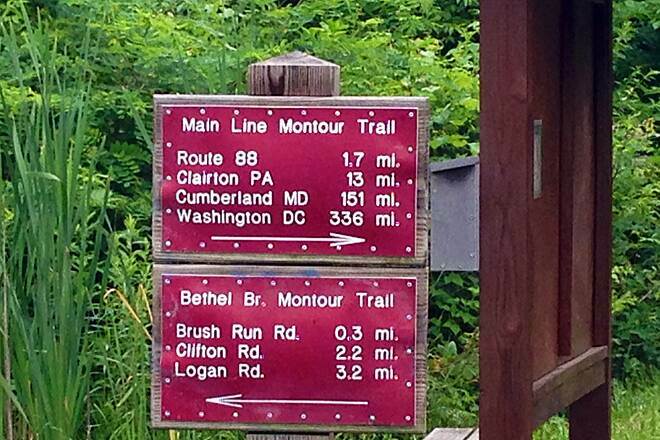 I did this trail on June 29th, having arrived in Pittsburgh from the C+O and GAP. 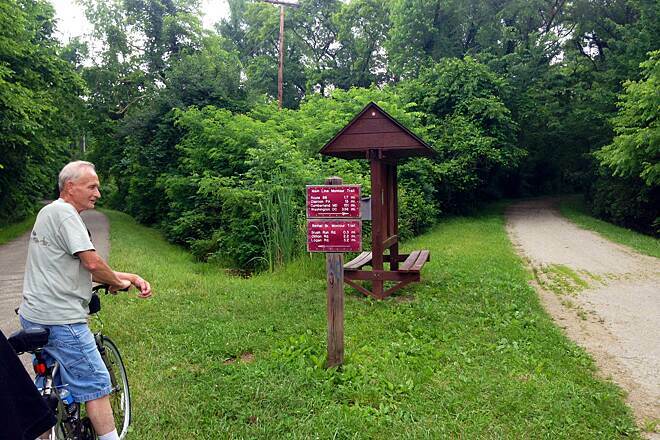 Stayed at a hotel on Neville Island so that I could be close to the trailhead at Coraopolis. 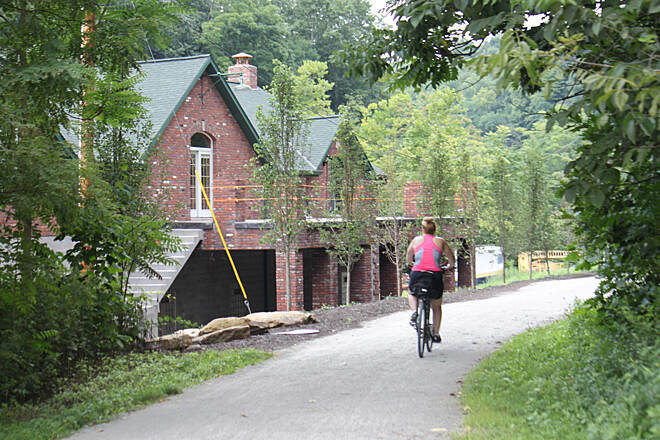 There is construction just after the trail entry and I had to ask locals for a surface road work-around (on N. Petrie St. connecting to Petrie), finally finding the Montour trail at the Hassam Rd. entry point. 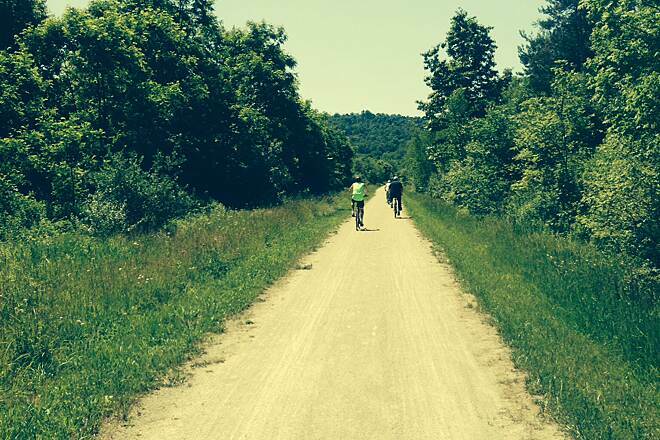 Once on the trail, it was smooth sailing. Connected to the Panhandle and was into WVa in no time! 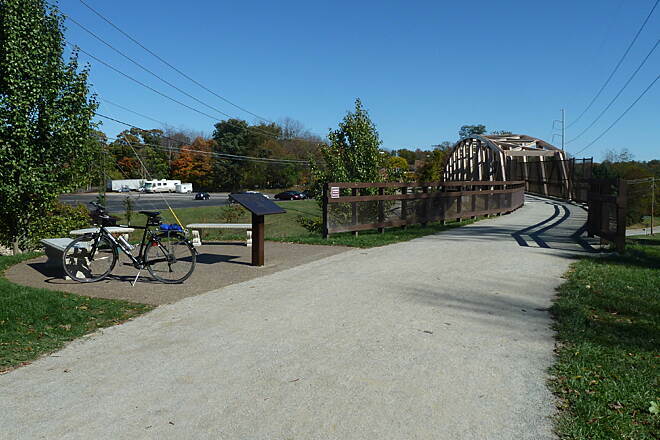 Great riding surface with large parts paved in Peters and many new bridges. 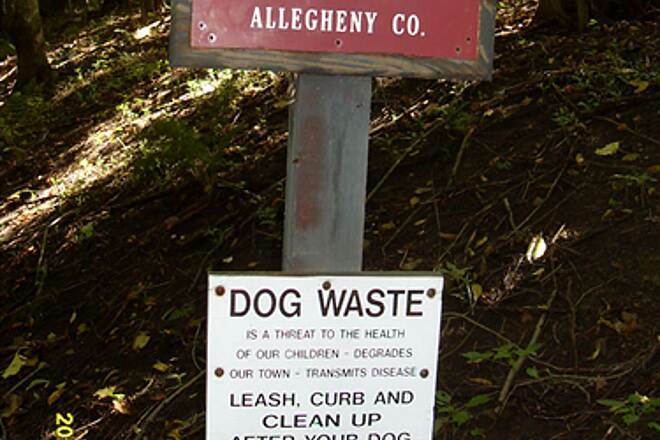 Way to go trail council! Maybe 40% in the shade. If looking for a place to eat and get a drink in McDonald, try Michael's Tavern. Good food at reasonable prices. 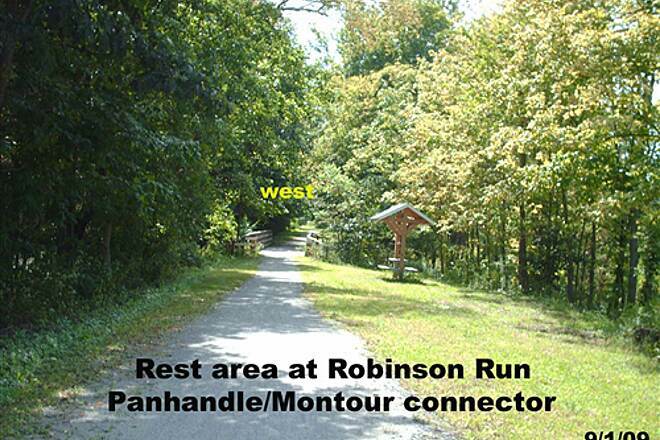 Also good place to stop right on the trail 10 miles from Bethel. Back to Bethel wad uphill quite a bit. A good ride. 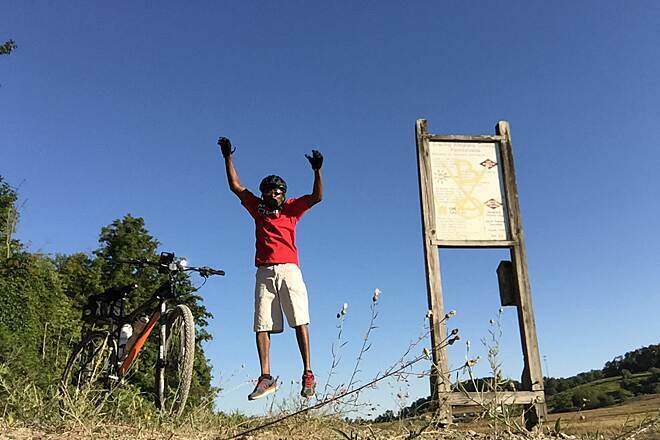 This trail was great for me when I was starting to get into riding. 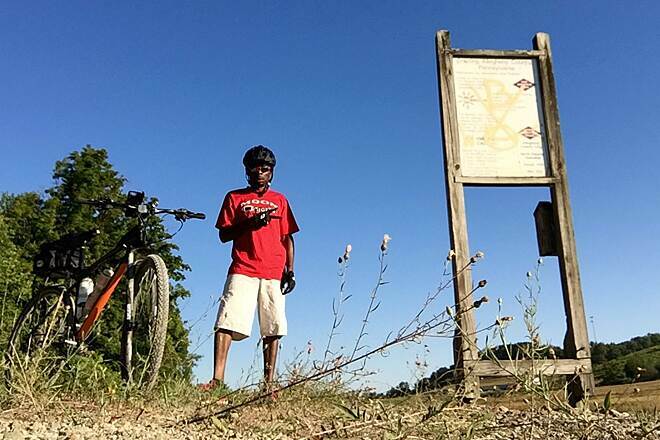 I typically rode from Cliff Mine to where it meets the Panhandle Trail in McDonald. The grade was mild and the view was good for the most part. First good ride of the spring! 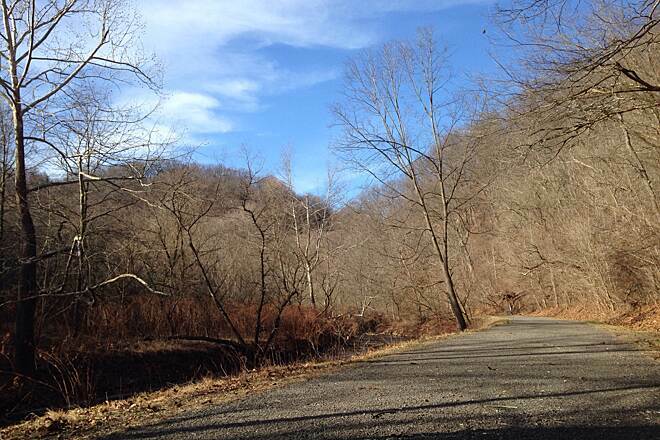 The Mrs. and I took a jaunt on down to the Hendersonville trailhead to ride today. The weather was perfect! 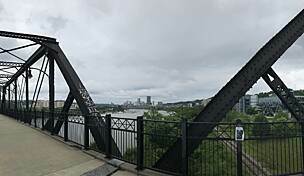 We started by heading east from Hendersonville till the trail hits a road section (3.5 miles or so out) then headed back west and north to the MacDonald bridge. Loads of people were out since this is the first really nice day we've had in Pittsburgh. Runners, bicyclists, folks walking the dog, and everyone was nice. Two short but neat tunnels and lots of bridges, large and small. The trail surface was a little bumpy in a couple spots, but for the vast majority of the ride the trail was fast, hard and smooth. 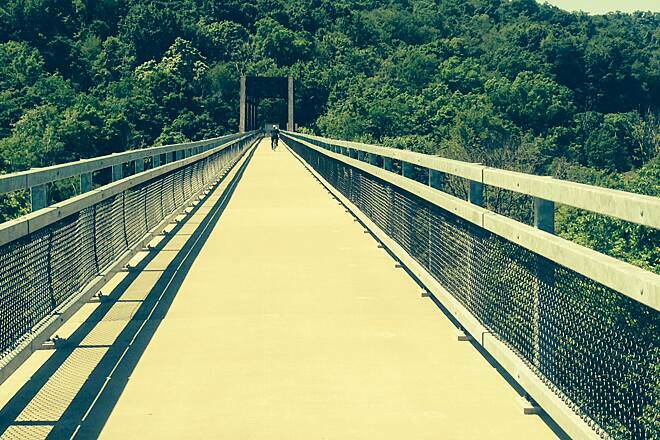 Pittsburgh is truly fortunate to have this trail! 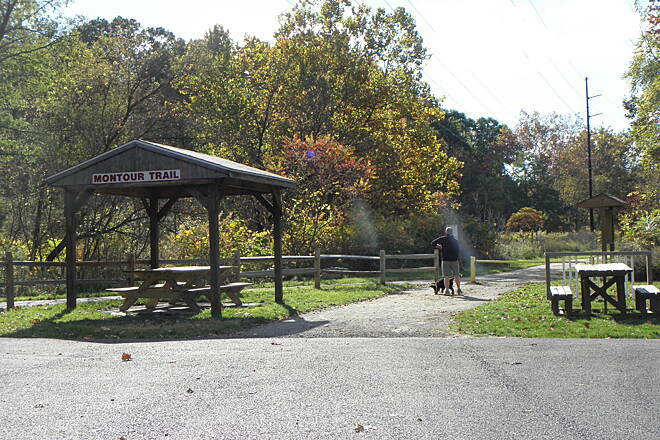 For the first ride of the season, my wife and I decided to park at the Enlow parking and ride north to the trailhead and then back to the Enlow parking lot. 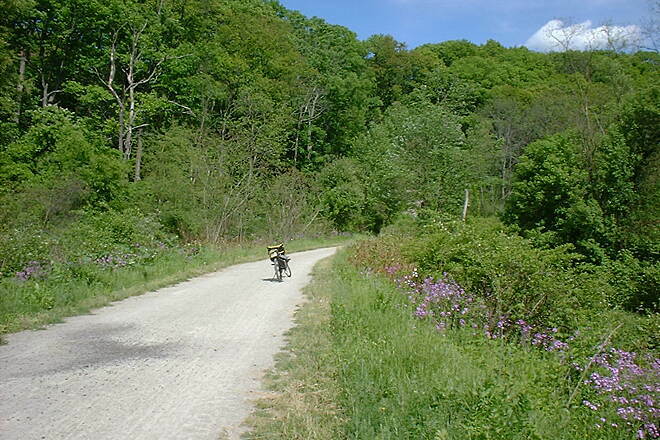 The grade is mild and the trail is smooth and well-groomed. While there are a few road crossings on this stretch, including a couple near the shopping center at Robinson, they are easy to navigate assuming you're being a safe cycler. 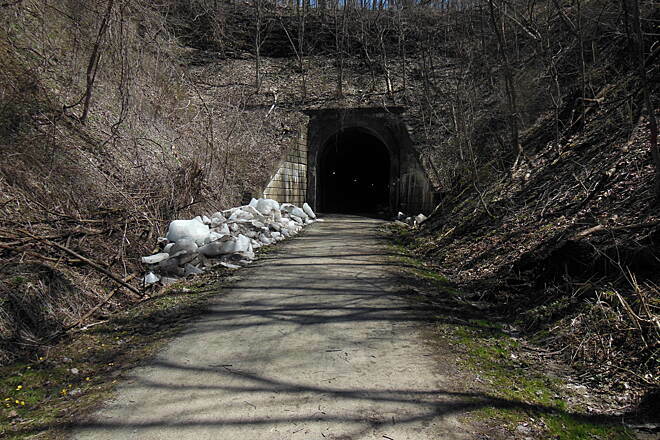 The old tunnel just north of the Enlow parking lot was what I really wanted to see, everything else was just gravy. 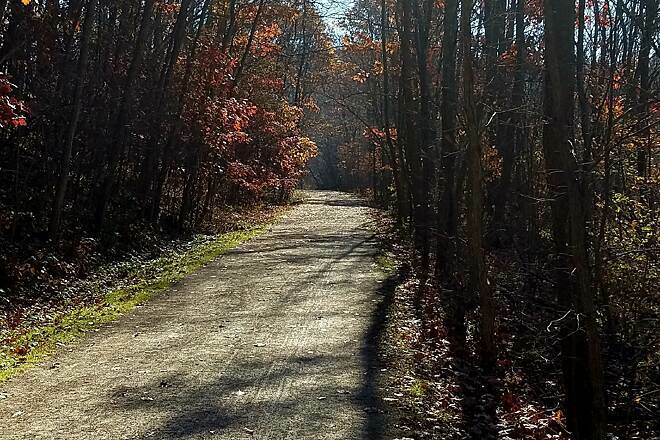 This is an awesome trail and I'm looking forward to riding the rest of it this year before the snow flies! 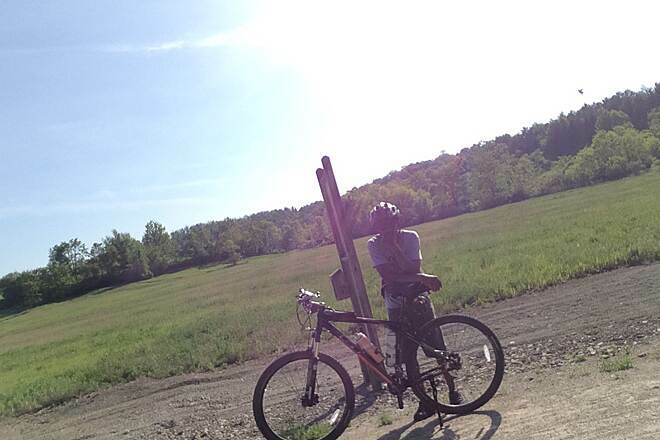 I rode the trail from Mile Marker 0 to 16. Great trail with very few hard climbs. The good thing is that they are downhill on the way back. My only bad review about this section was the "sandy beach" spot between 11.5 and 12, and the really bad area between 15 and 16 (after the bridge at Quicksilver Golf Course). 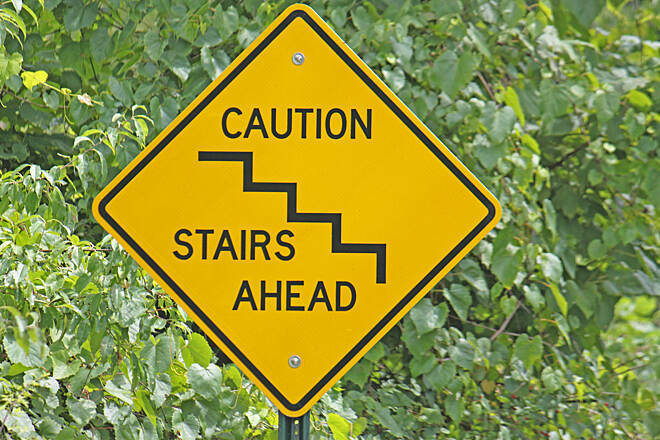 Watch your speed through these sections. 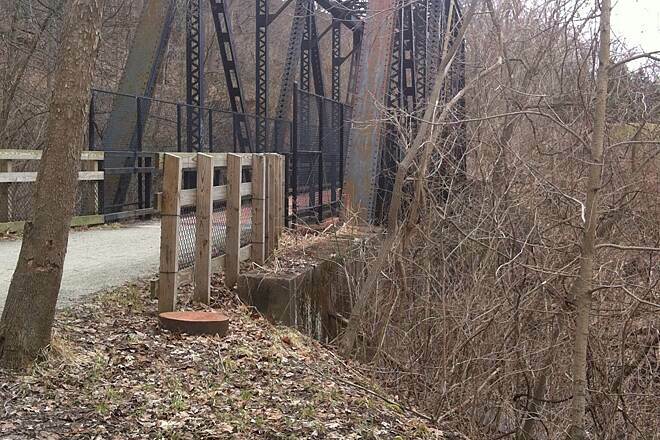 Hopefully the Trail people read this and fix these areas in a timely manner. 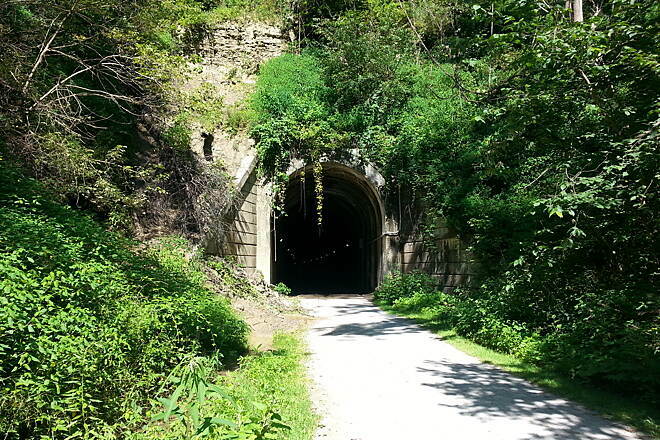 The Montour Trail was without doubt the highlight of my ride. 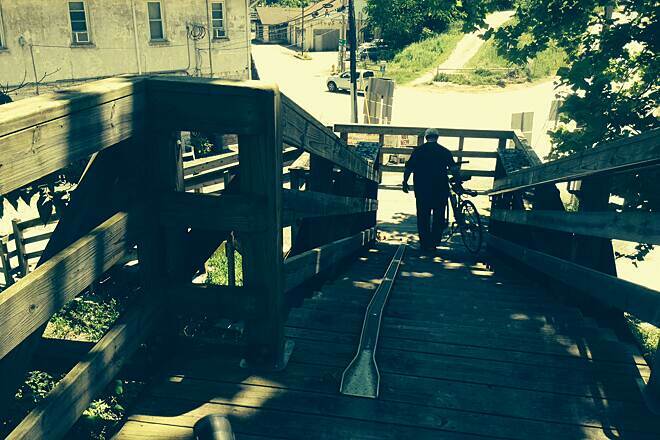 Starting from Clairton and finishing in Coroapolis it was, on the whole, a fantastic experience. Again, there is a common theme here relating to signage. Two areas especially stand out: the crossing of State Highway 51 and around Library where, if it wasn’t for an experience local rider I’d caught earlier in my travels, I’d still be today! 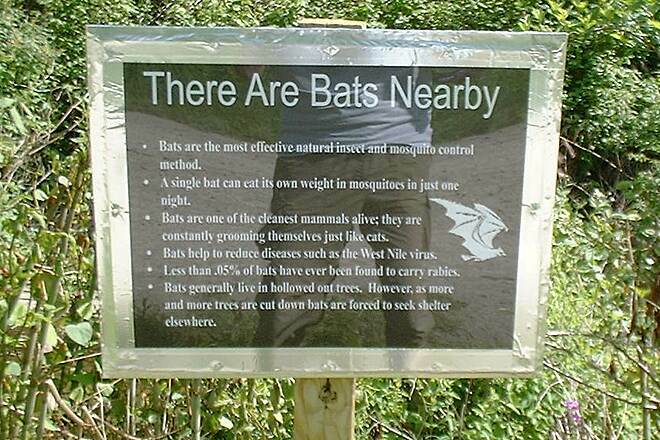 You see the signs disappear at both the aforementioned so do your homework before setting out if you are a first-timer. Having said that about Library, the views when one gets back on the trail at this point are spectacular especially looking over towards the horse ranch – true Americana! In fact the trail just got better and better from this point onwards. 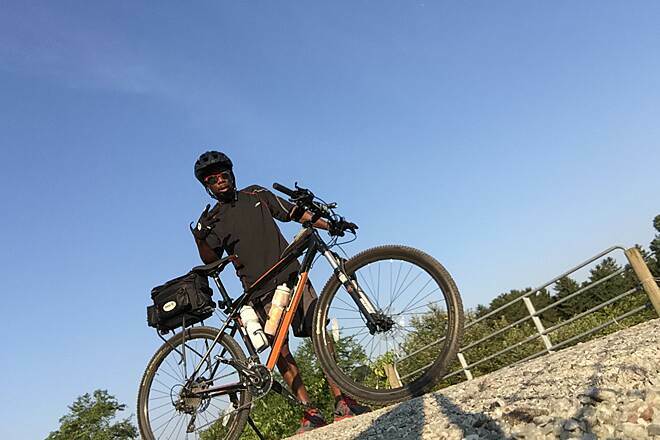 There were adequate food stops should I have needed them and there were even a couple of water fountains strategically positioned which were a welcome relief on the day of my ride I can tell you! There was nothing taxing about any of the trail surfaces which did vary from tarmac to grass but everything was easily rideable. The trail route when following the railway line was a very slight incline – nothing too strenuous. However, it is worth pointing out that when following the sections of the trail that were on the road, whilst the hills weren’t alpine category but I would expect to see most people shift down a gear or two on some of the inclines! 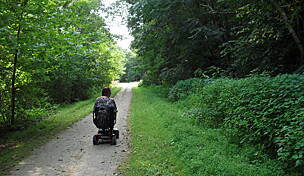 The trail is a fantastic experience with wonderful wildlife and lovely scenery virtually motor-free. 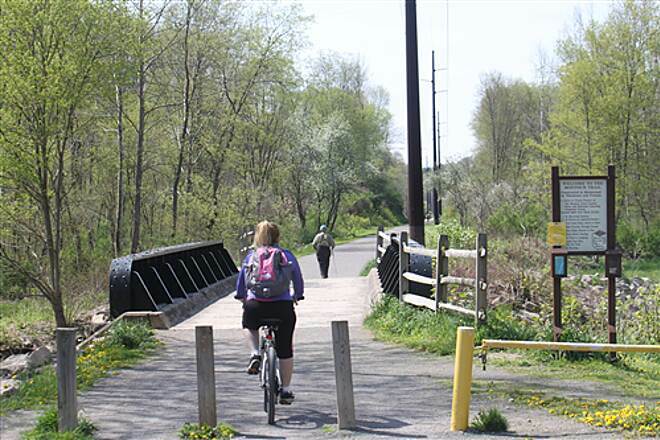 It is a great shame that the Montour Trail doesn’t easily link back to Downtown Pittsburgh but one can live in hope that it will get developed in the future! 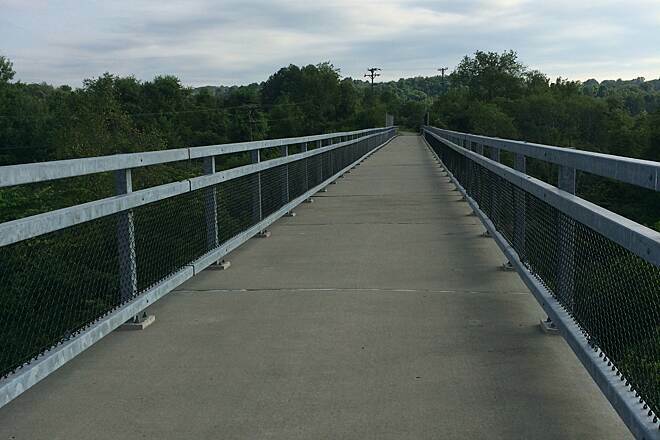 The trail has completed the bridges over Morganza Rd and Georgetown Rd. There is a bike rental shop Tandeum Connection at the Morganza brigde. 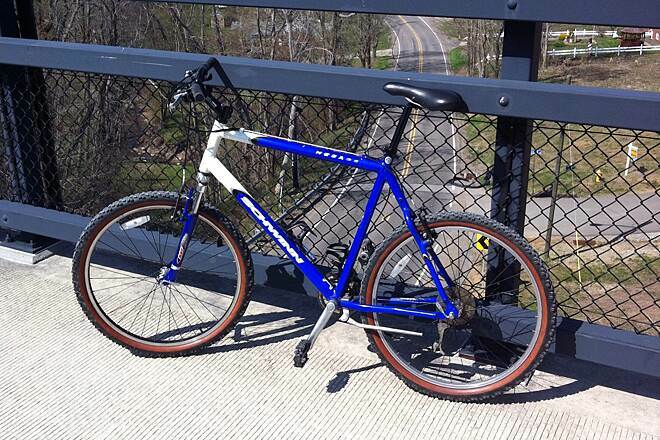 You can rent a bike, get refreshments and they also have bike parts if you run into trouble. 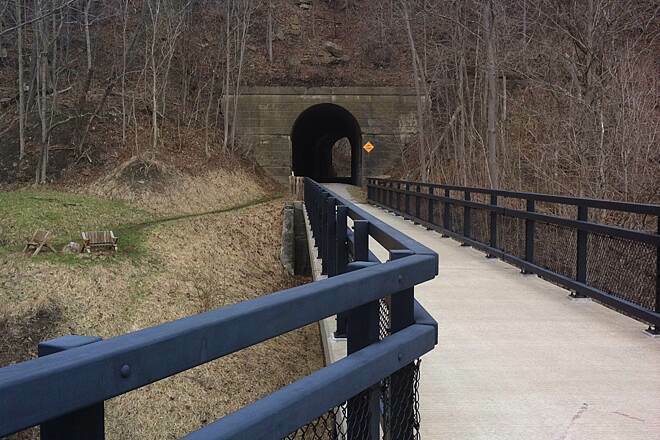 This part of the trail has wonderful bridges and railroad tunnels. 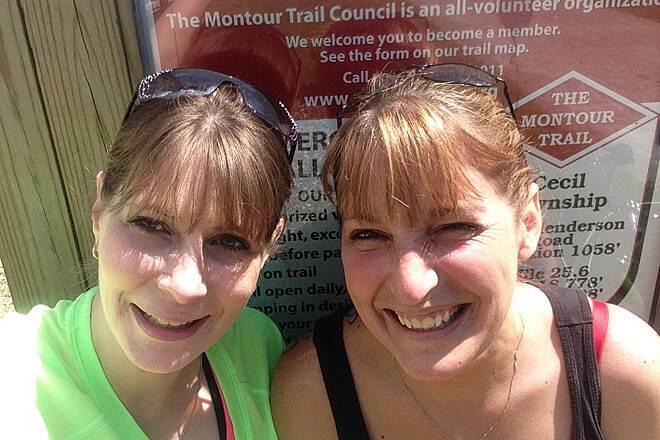 Montour is a hot trail! 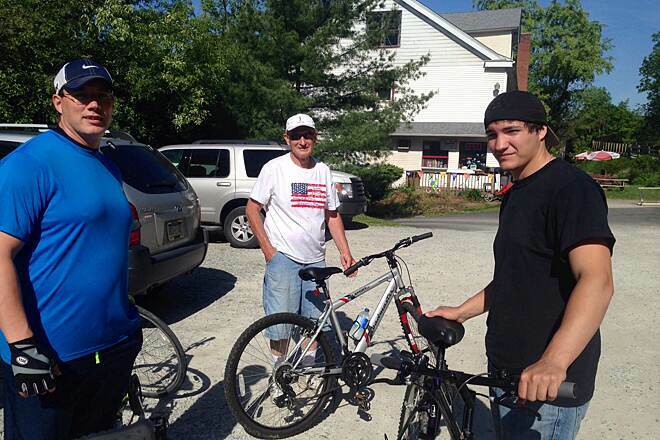 We rode on the Montour Trail on an August Sunday afternoon from Imperial to McDonald and back. The trail is somewhat bumpy and I got a flat on this trip. Alot of the trail is in the sun, so have water and be prepared to be hot! We had trouble finding the trailhead - we drove out to the airport and then tried to find it, but we got lost a few times. The roads are not well marked out there. McDonald is a fun, small town. There are 2500 people who live there. 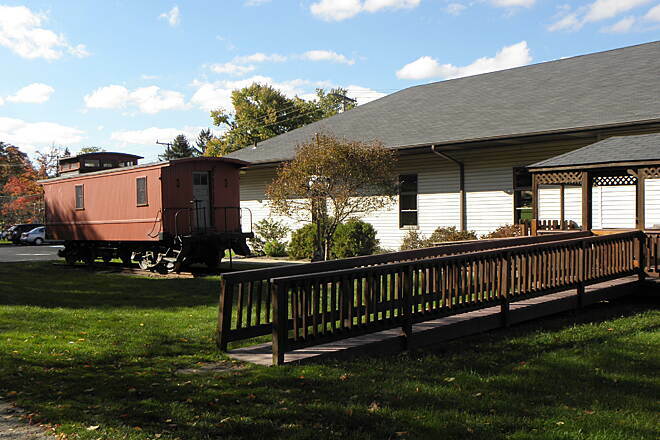 We stopped at the old train station and talked to two old ladies there who were very interesting and gave of lots of information. The train station is worth a stop! There are lots of pizza places and a Subway shop in McDonald. In addition, there is the best ice cream shoppe I have ever been to with sky-high soft ice cream cones for only $1.85! 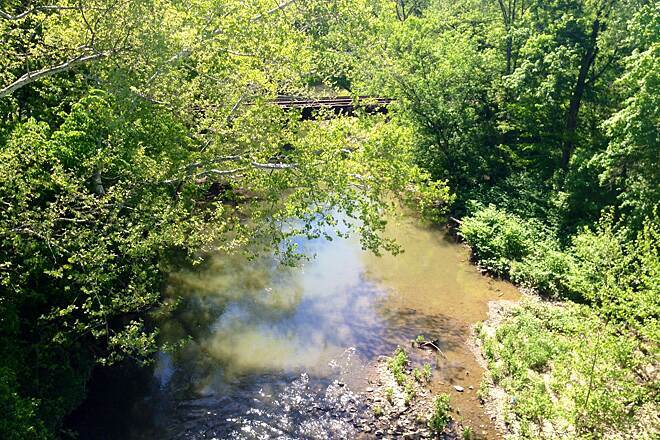 All in all, the Montour trail is well maintained, with lovely scenery but be prepared for hot! 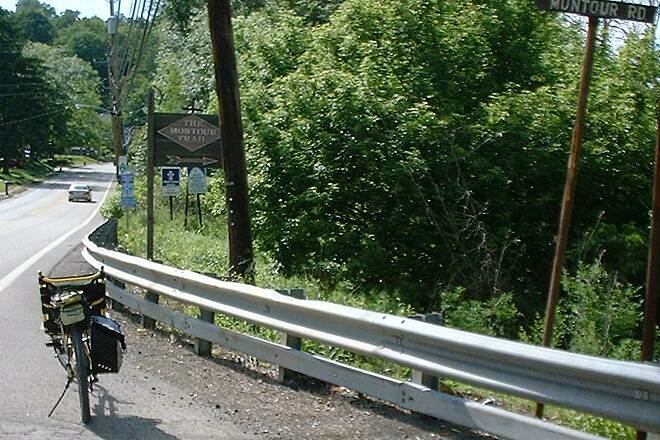 At 317 east Lincoln Avenue, McDonald PA you will find everything you need to satisfy your appetite after a long ride. Homemade, very reasonable prices and BIG menu make this our must stop after a long ride. Dine in or take out with daily specials. Today was the 16" cheese pizza ($6.00; additional topping $1.50. Try the cappicola). Traditional pizza (handmade dough, homemade sauce), specialty pizzas (try the pierogie pizza yunz Pittsburgers! ), fresh hoagies on Mancini's rolls, burgers, soups & salads, appetizers and munchies. Open daily 11AM. YUMMMMM! Numerous starting points and well marked when you must leave the trail. 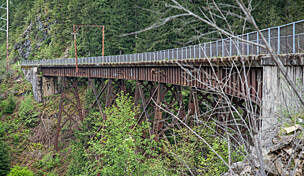 Great bridges and trestles and a few tunnels. This trail has it all. Better with a little wider tire but most areas can be ridden on 700X35 or 26" smooth tread. 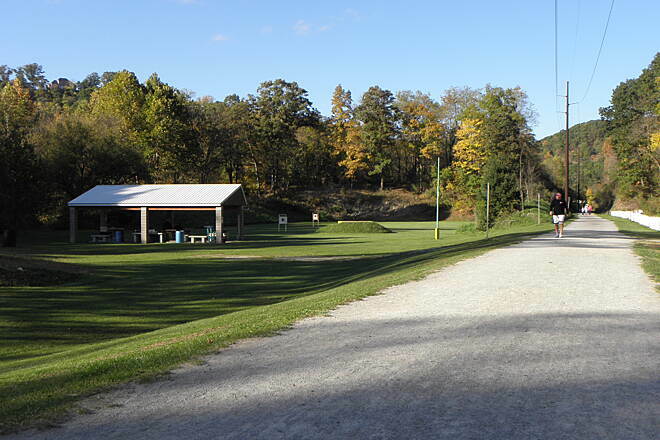 Pleanty of shade and numerous rest areas and water stops. 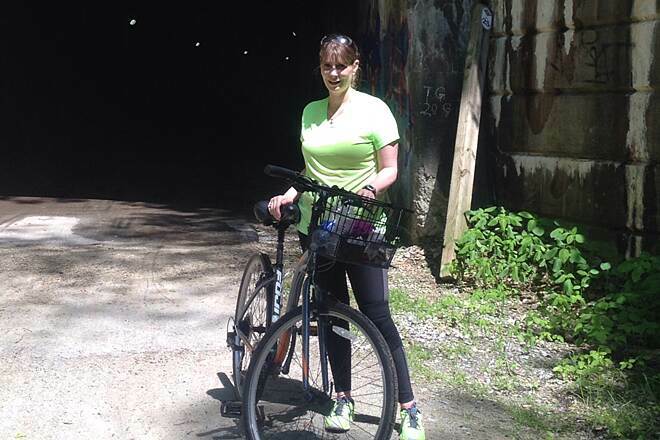 My wife and I rode the Arrowhead Trail portion of the Montour Trail on a beautiful Saturday afternoon. 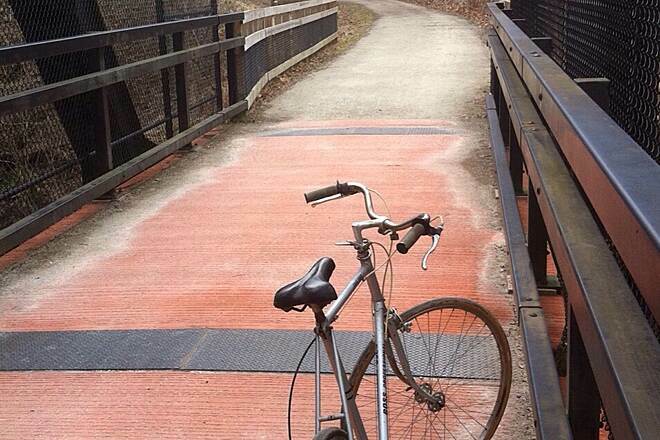 If you are into a paved surface, this is a trail for you. 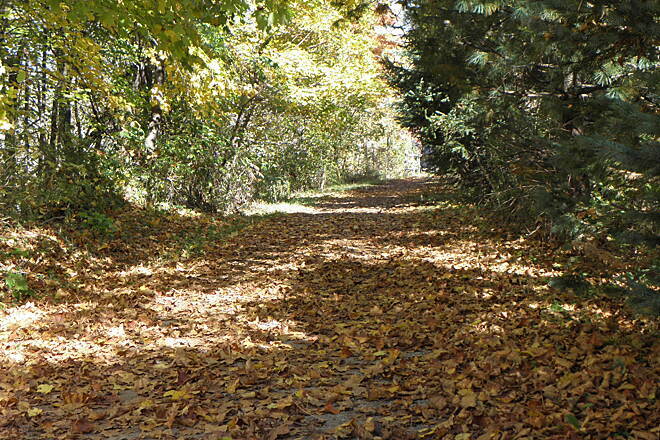 The path surface is smooth and is used by bikers, bladers, runners, walkers and a lot of mothers with baby strollers. 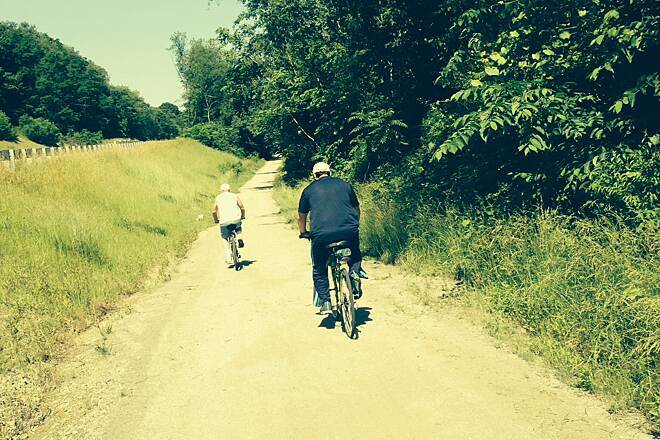 This is truly a family trail but for the bikers this means a lot of dodging the other people on the trail. 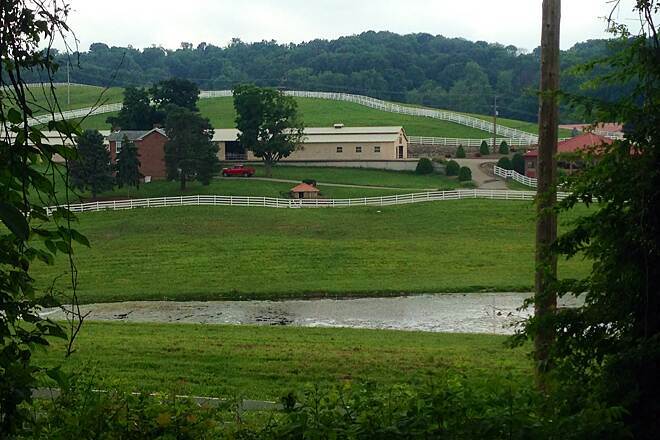 There are a number of good places to stop and get a bite to eat and lovely horse pastures along the way. 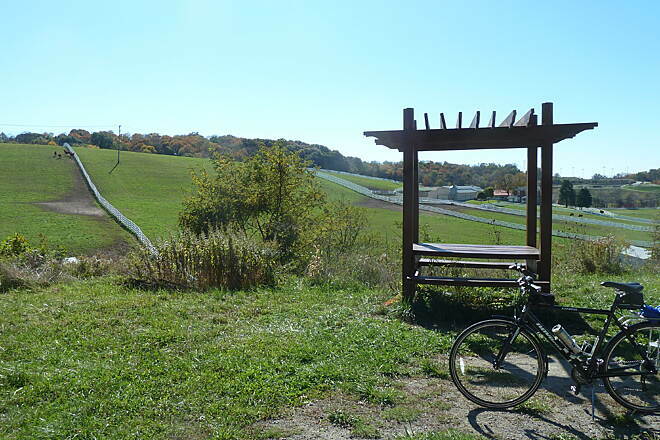 The Arrowhead Trail is a very enjoyable part of the Montour Trail. 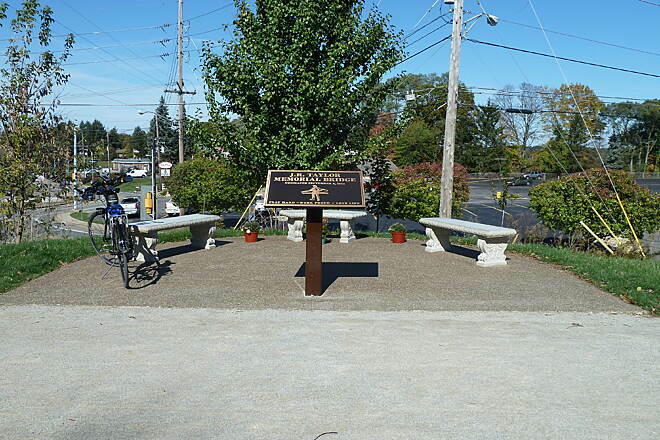 On October 18, 2008 a new section of the Montour Trail was dedicated and opened. 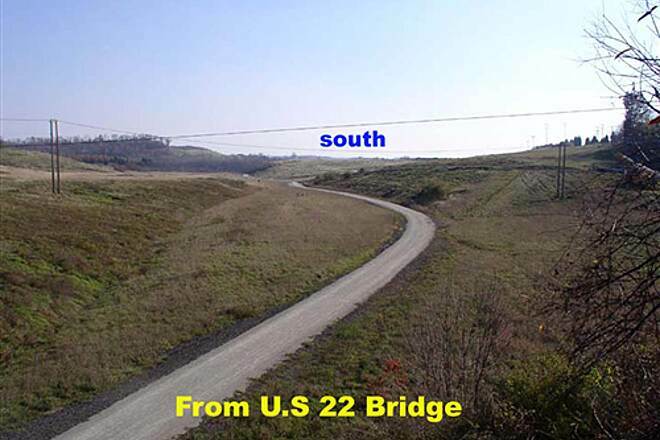 It spans a five (5) mile section from Hendersonville west to the U.S.RT.19 corridor on Saddlebrook Road. 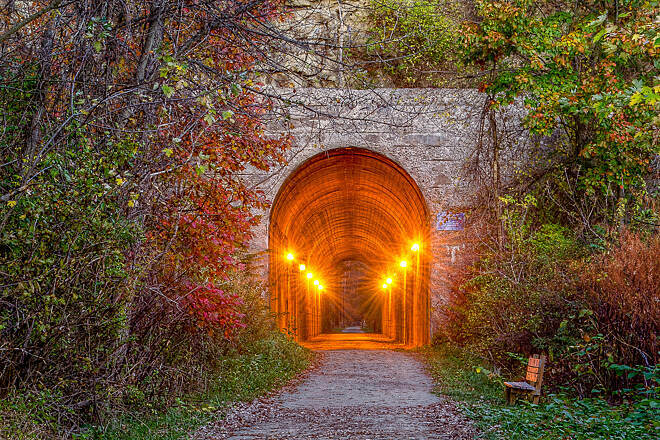 Three bridges and one tunnel are there to be enjoyed by the traveler. This is definitely a "JEWEL" to be experienced first hand. 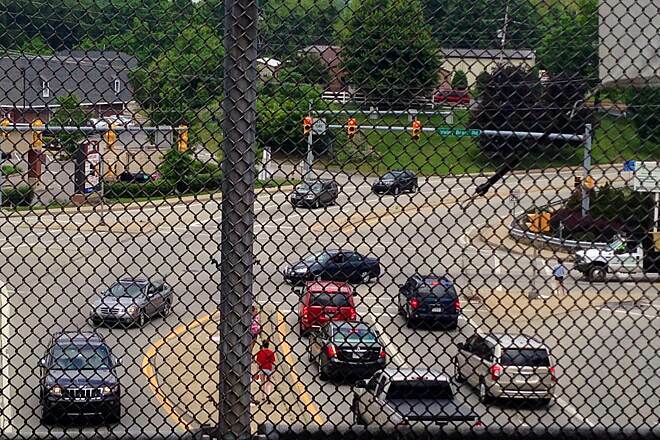 There are two (2) road crossings that require you to walk down/up embankments but definitely well worth the effort. Foliage during this FALL was outstanding to say the least! Many years of efforts by various entities, both on and behind the scenes made this segment possible! 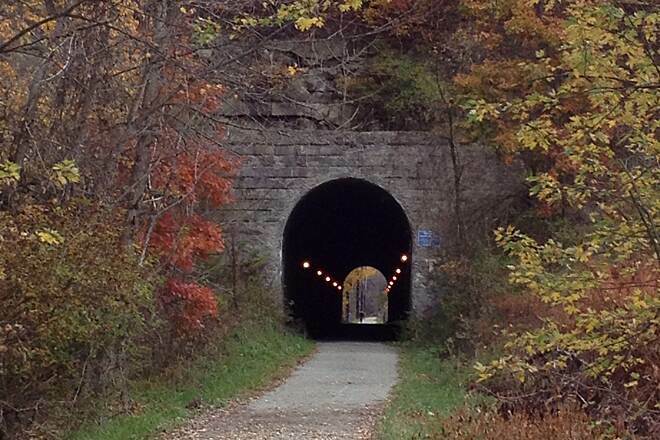 I am a long time rider of the Montour Trail and I don't know if it gets any better. 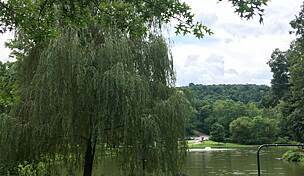 It can be a very hot trail in the summer but the scenery down around the gun club is excellent. 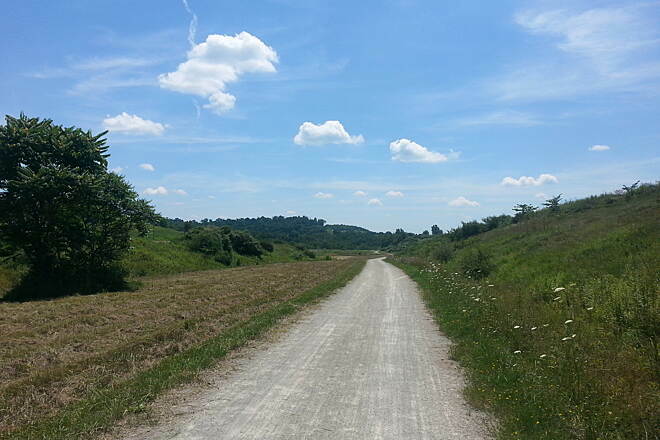 As you get up the other end of the trail it becomes more desolate and peaceful. What is nice about it is that you can do as many miles as you like. It will really be nice when it is finally completed . 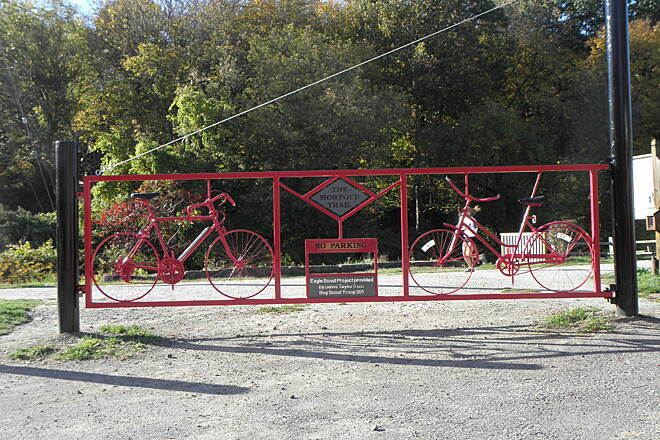 Also you can hook up with the panhandle trail in McDonald. 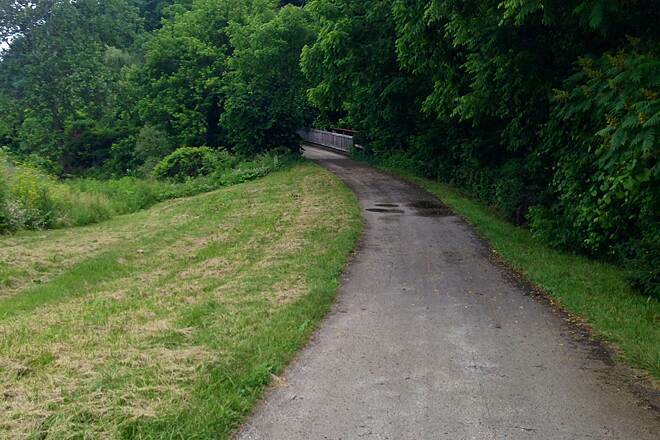 That is also a nice trail that runs down into Renerdale. That is what I mean when I say you have the best of both worlds. Get out and have some fun. 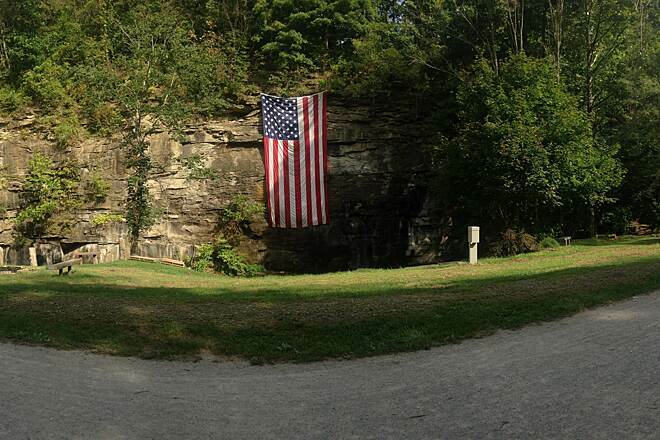 Hope to see you on the trail. 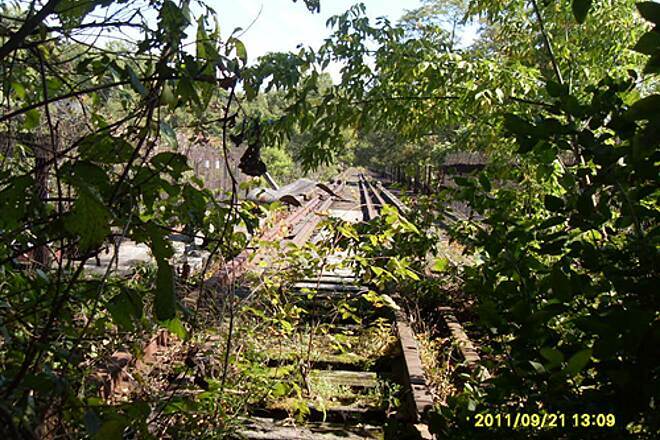 "This trail is great, though still incomplete. 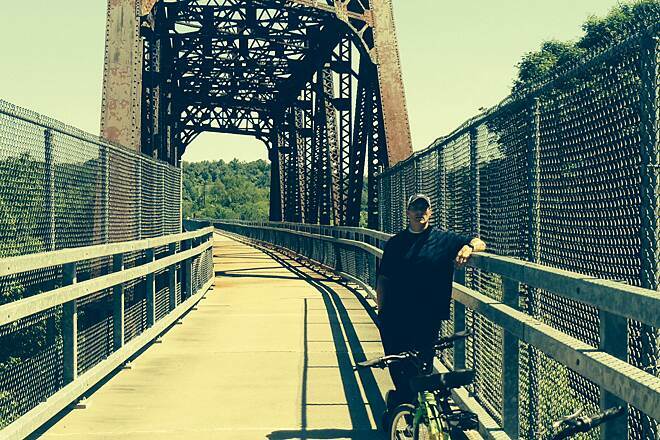 I rode from Coraopolis to mile 15 and back, and enjoyed every minute of it. One caveat: the trail gets rough in a few places west of Imperial, so your tires and backside may suffer. The scenery in this stretch is very nice, though. 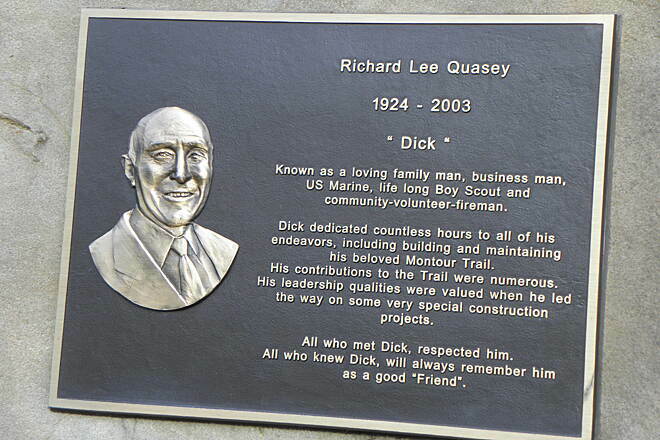 I'm looking forward to the trail's completion." 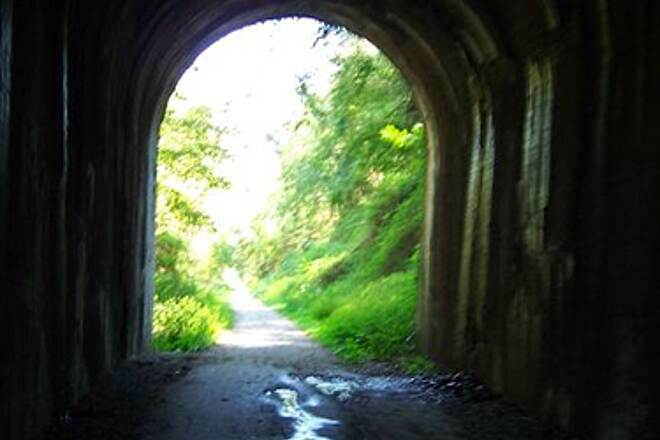 "This is one great trail -- complete with hills, tunnels and bridges. For the most part it's extremely well maintained limestone (the section between Quicksilver and McDonald needs some attention because of the extremely bad rains we've been having, but they're working on it). 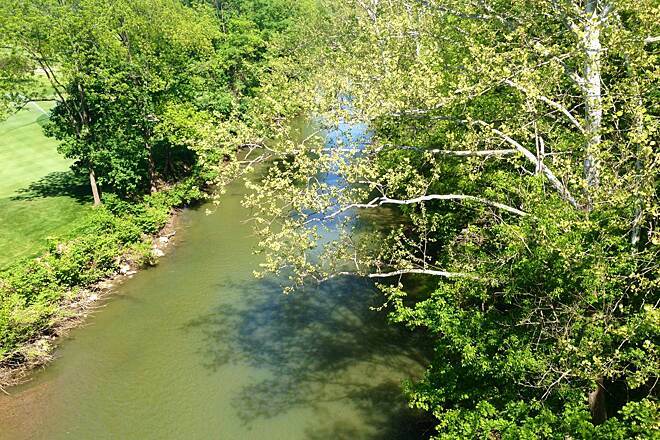 You're crossing between at least three ""watersheds"" so there are some nice grades on it. 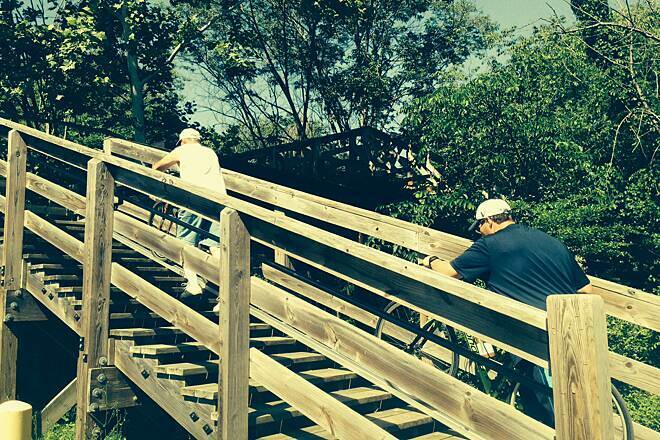 Yes, there's some work involved going up but the downhill portions are well worth it! 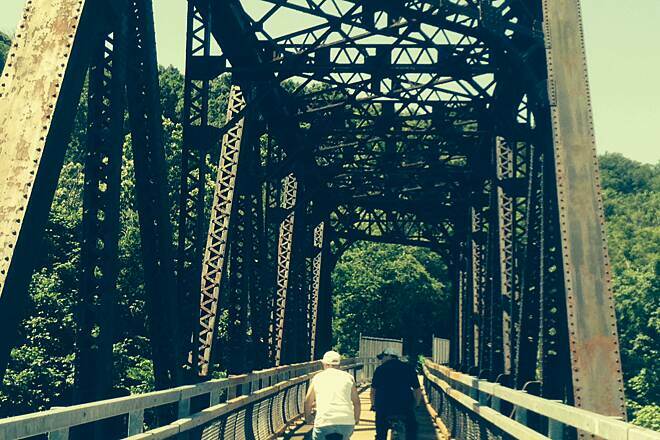 The McDonald Trestle is simply fantastic. 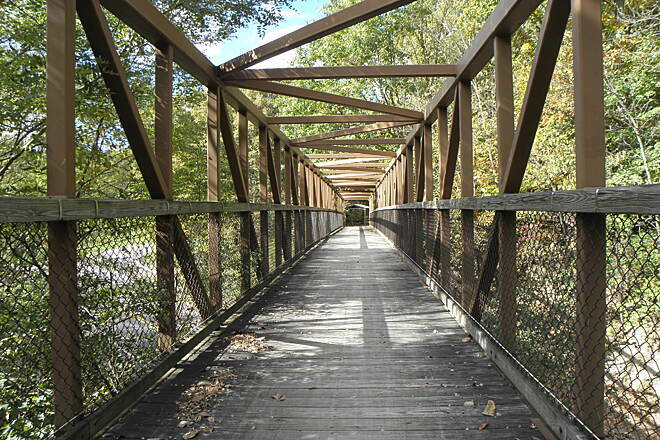 It has the best deck (concrete) and workmanship I've ever seen on a large trail bridge. 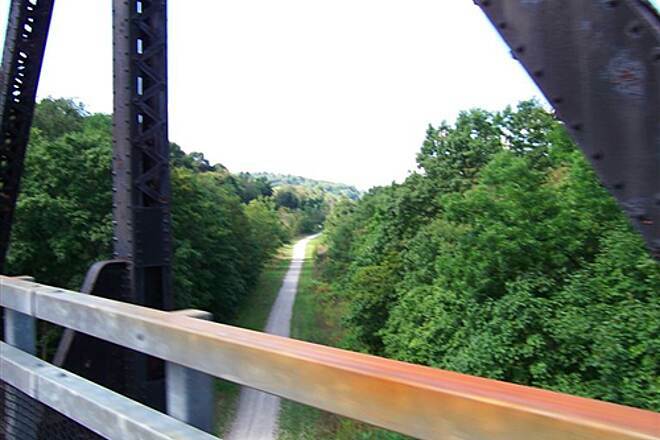 You can do half-century and metric century rides entirely on this trail. 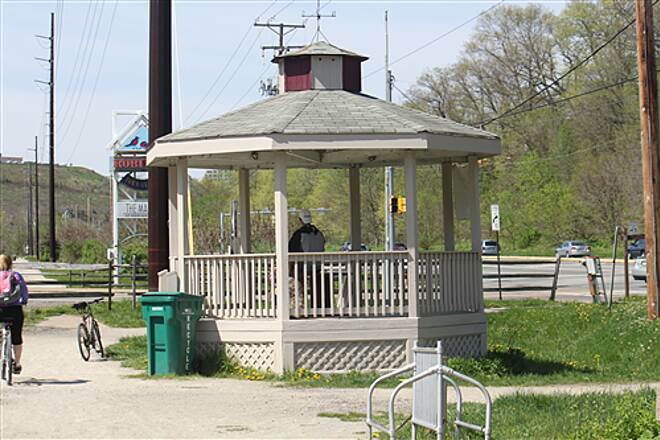 And if there are any problems you're always close to a community -- it's a big half-circle around the western Allegheny and Washington County communities. Two short ride-able tunnels (although they frown on riding) add to the fun. 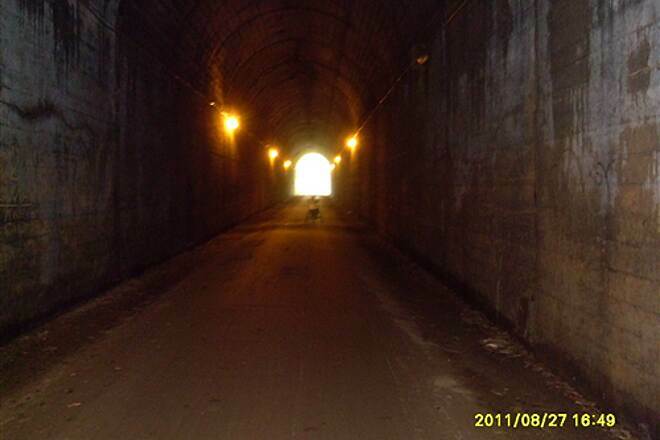 Bring a light for the National Tunnel near Cecil, but the Enlow Tunnel near Imperial actually has lights! 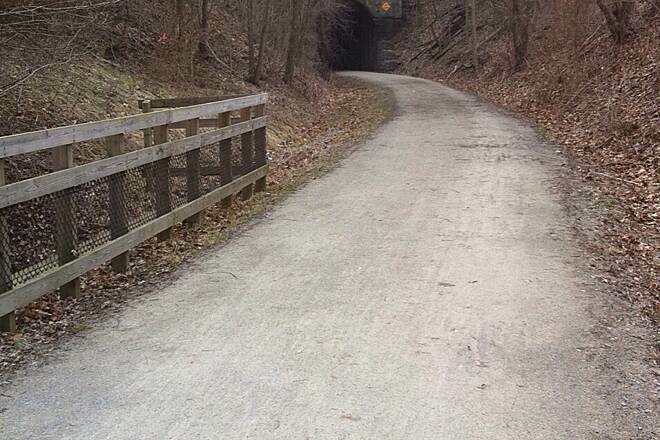 "While in the area on vacation from Florida my wife and I rode this trail. 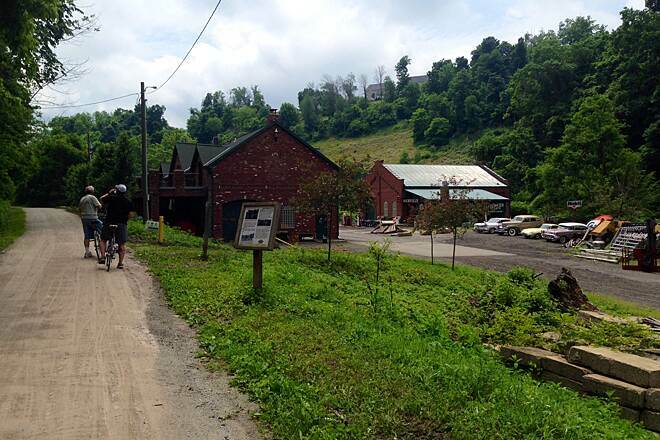 We started from the trailhead in Coraopolis and rode toward Imperial. We had planned on riding all the way to Mcdonald but due to all the fun we had exploring the various ""off trail"" paths that we found we ran out of time. 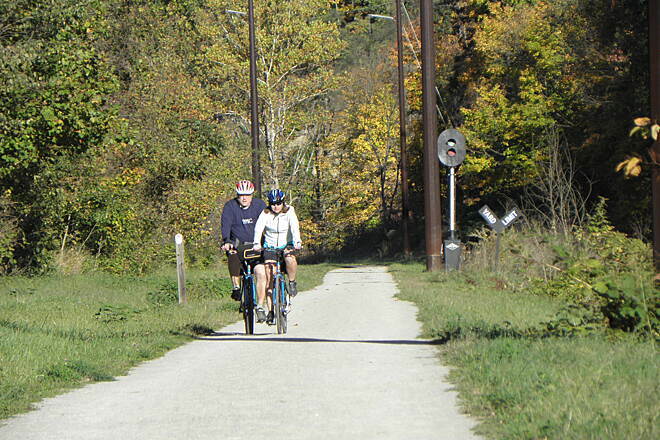 We found the trail to be very well maintained and a pleasure to ride. We rode into Imperial where we were able to find a great little pub where we had lunch. 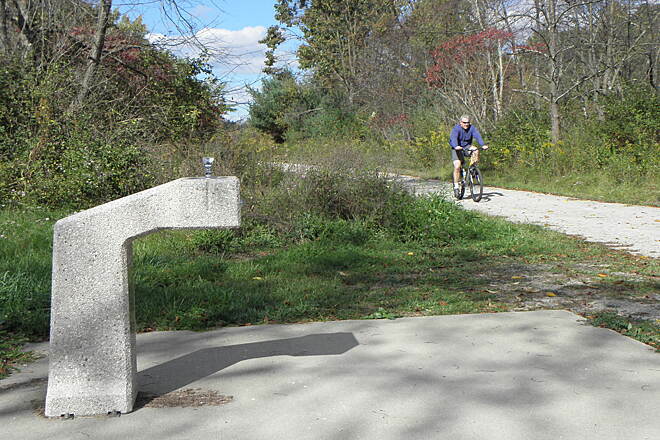 We found one water fountain along the trail that was turned off. 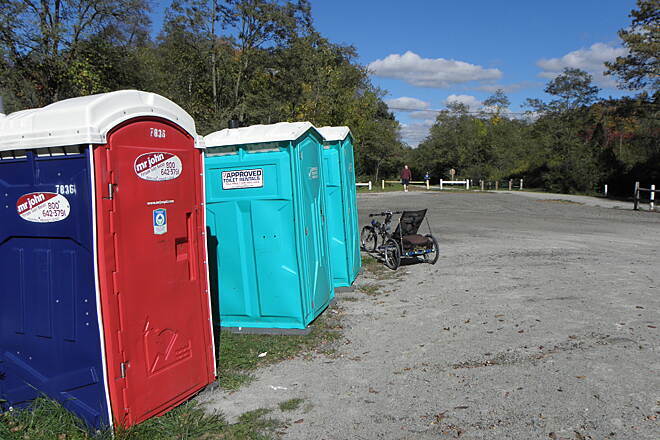 I guess it is a seasonal thing, and there were plenty of Porta Johns at the various trailheads. 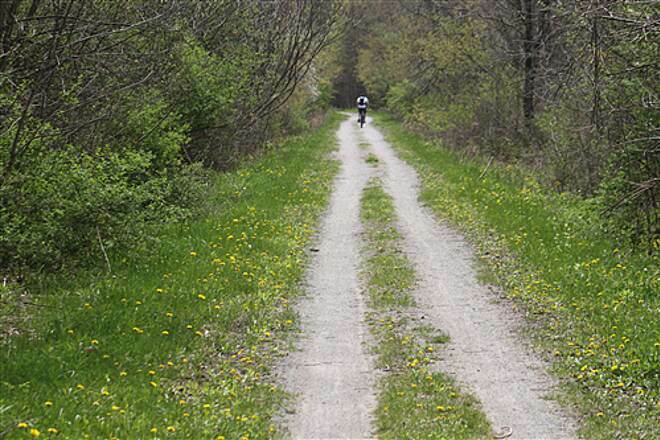 If you have a mountain bike be sure to take some of the paths that leave the main trail. 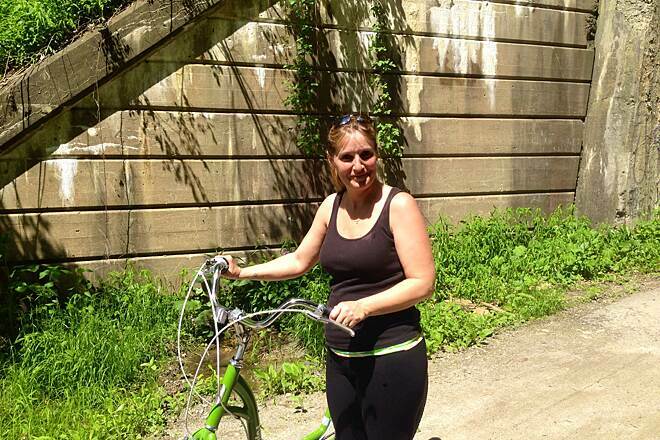 My wife is a very novice mountain bike rider but she had absolutely no trouble on the trails. We will definitely be back when up in the area." 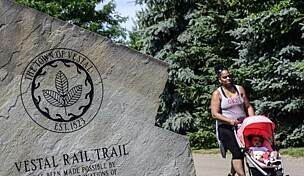 "The best thing I liked about this trail is that it's paved so you can rollerblade, but it's not next to a noisy polluted freeway (as is the Eliza Furnace Trail). It's nice not having cars wizzing by and breathing exhaust fumes from cars as you're biking or skating. 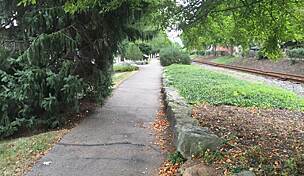 There are two minuses to this trail, though: One is that the paved portion is a bit narrow, and on a crowded afternoon it's sometimes hard to get a good full range of motion on skating strokes. 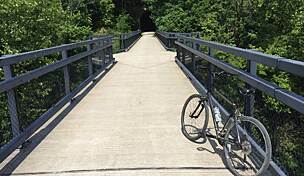 The other is that about one mile into the trail, the pavement starts to ripple, making the ride a bit bumpy for both bikers and bladers. 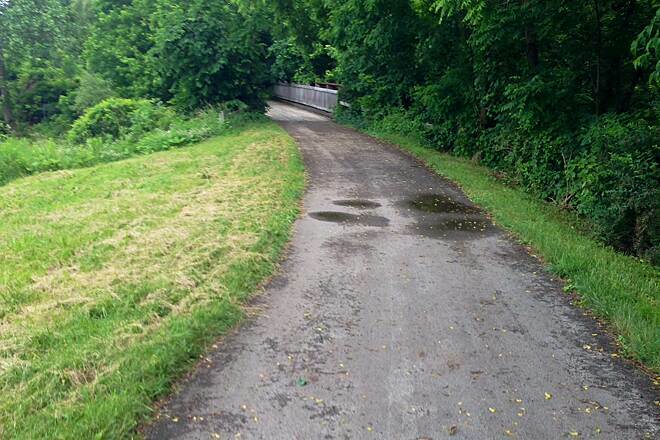 Although there are no potholes, there are a few cracks, and this trail probably could use a new paving job soon." 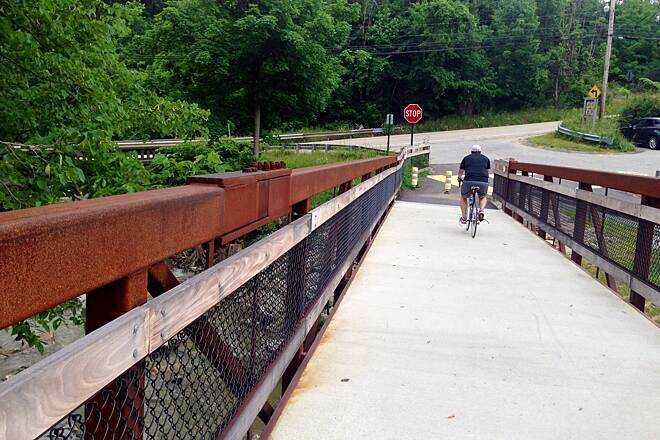 "I've ridden the Montour trail about a dozen times at different times of the day/week. 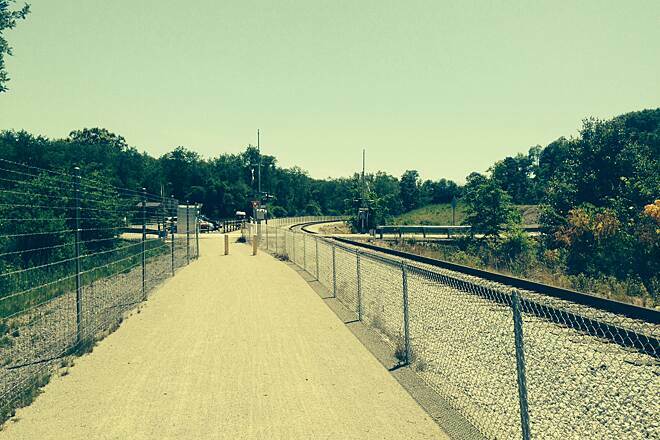 It's a very good unpaved trail, consisting of a crushed limestone surface. 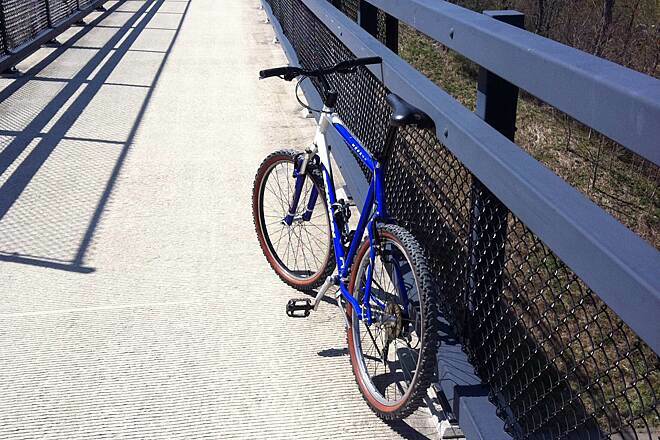 It's smooth enough for suspen-less bicycles, but it's a bit tricky if you ride a skinny-tire bike, due to the slightly loose surface & mild crown at some areas. Also, during summer months, occaisional heavy thunderstorms will create minor washouts along the trail due to the lay of the land. these washouts are usually remedied quickly. 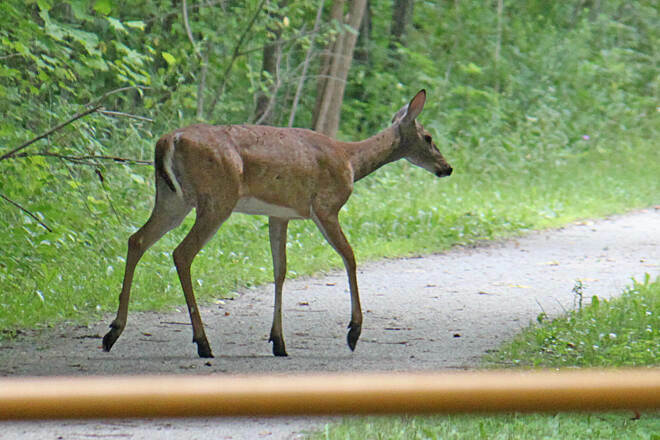 This trail can get very busy, especially around noon. 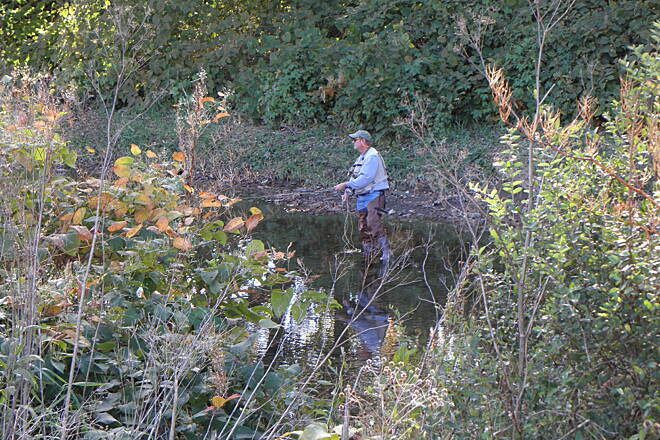 Many employees of corporate offices located near the trail use it during their lunch break. 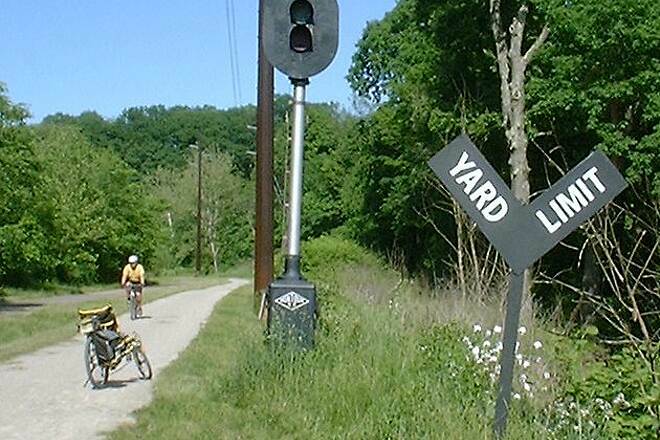 Also, you get the standard variety of trail users, from the slow walker to the fast runner & speedy cyclist, so one must constantly be on the lookout ahead & from behind. 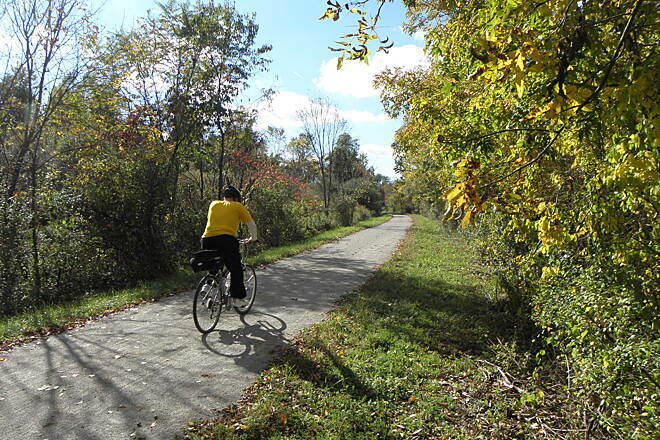 The trail is wide enough for 2 to pass each other comfortably, but not wide enough to accompany 2-abreast, which you will encounter by surprise from time to time if you're not paying attention. 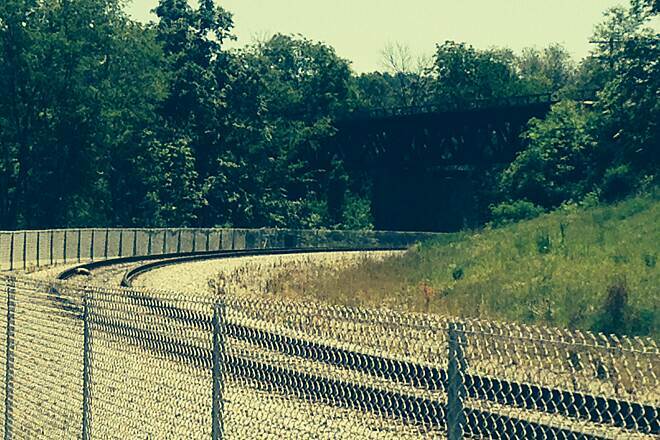 This trail is expected to link with other trails in the very near future, which may ease congestion a bit.